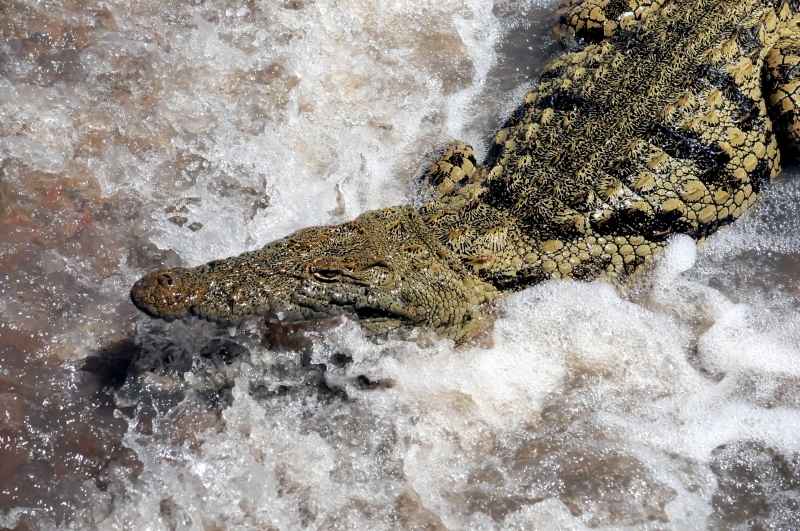 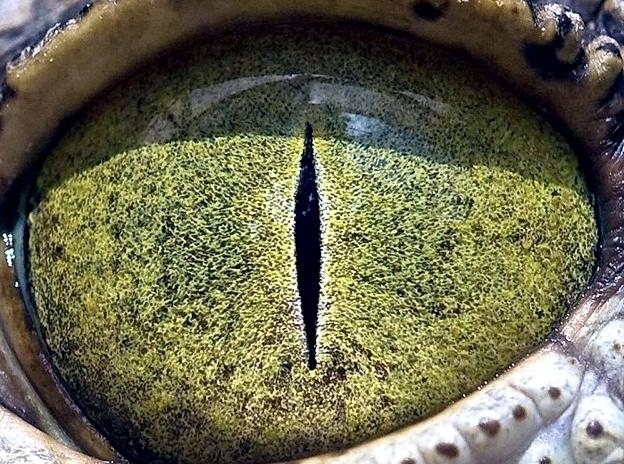 The Nile Crocodile has a well-deserved reputation as a vicious man-eater. 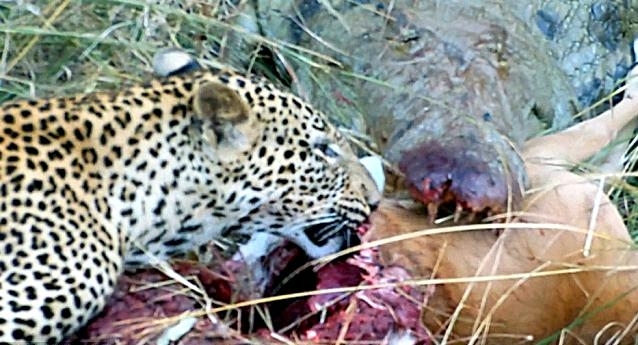 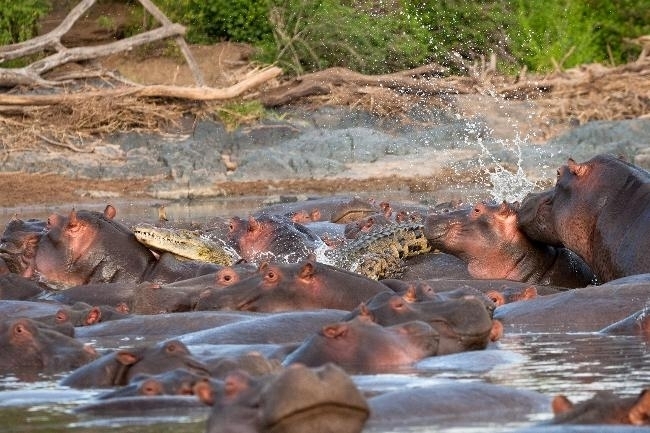 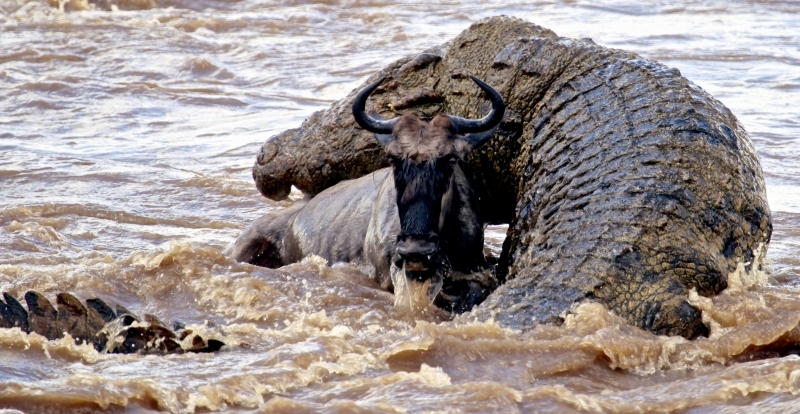 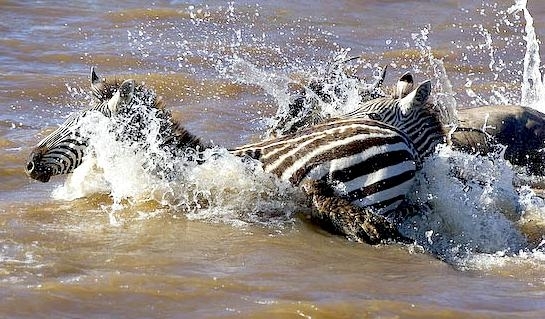 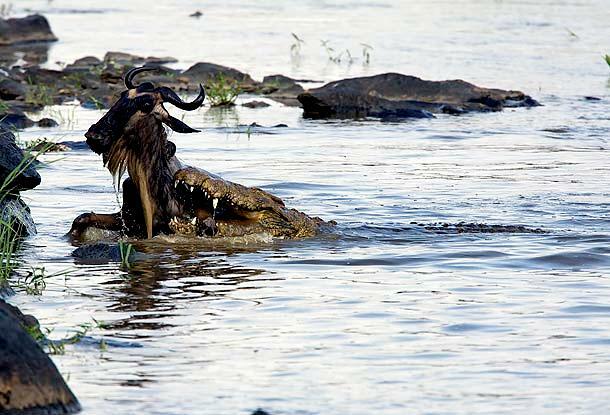 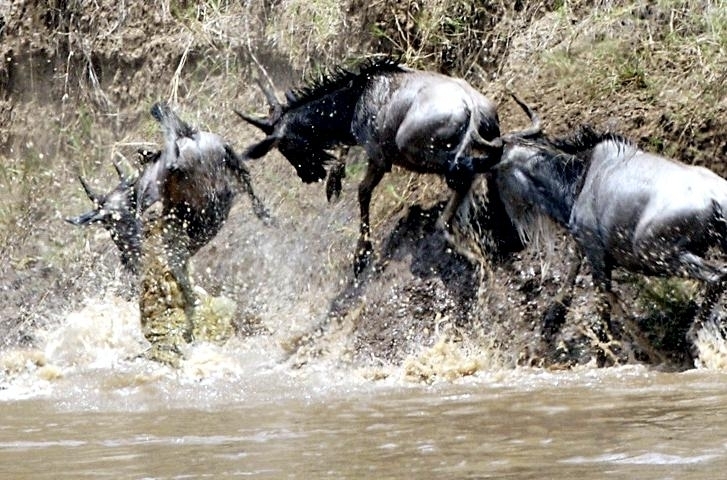 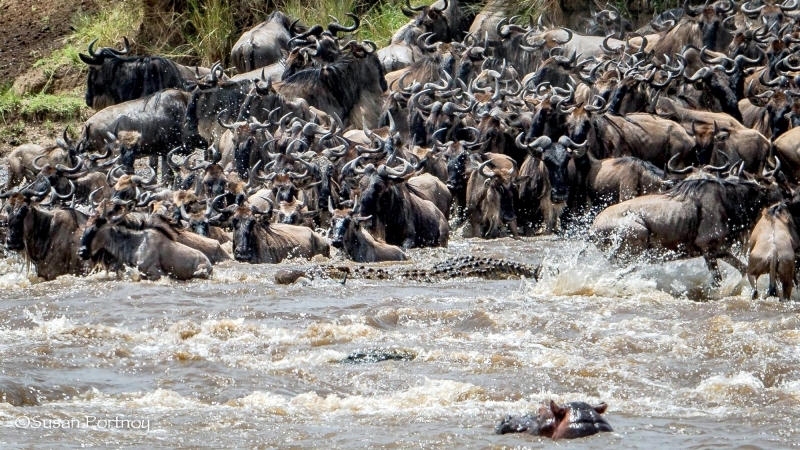 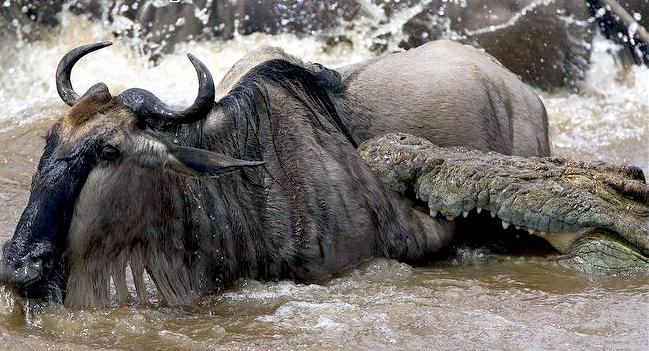 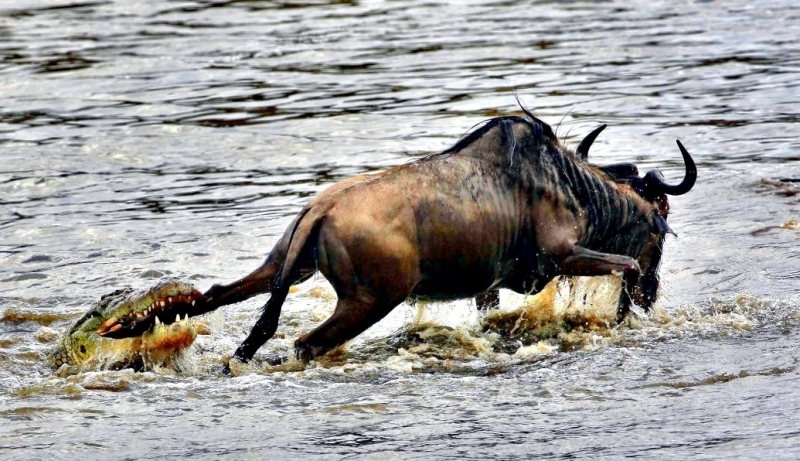 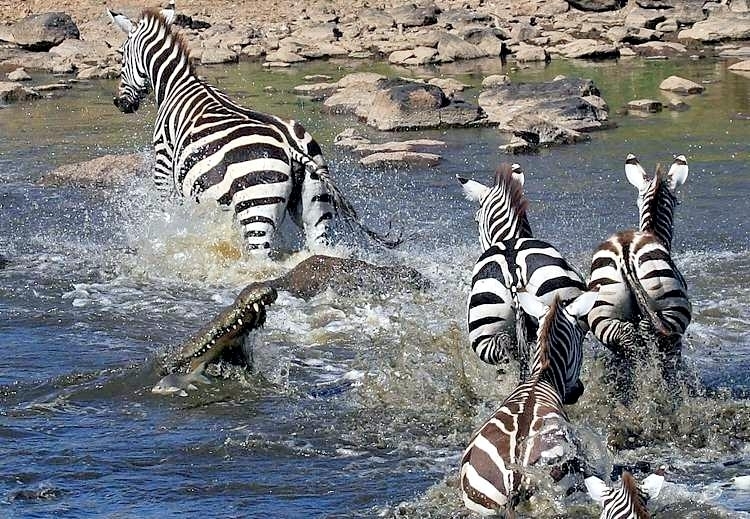 The proximity of much of its habitat to people means run-ins are frequent and its virtually indiscriminate diet means a villager washing clothes by a riverbank, might look just as tasty as a migrating Wildebeest. 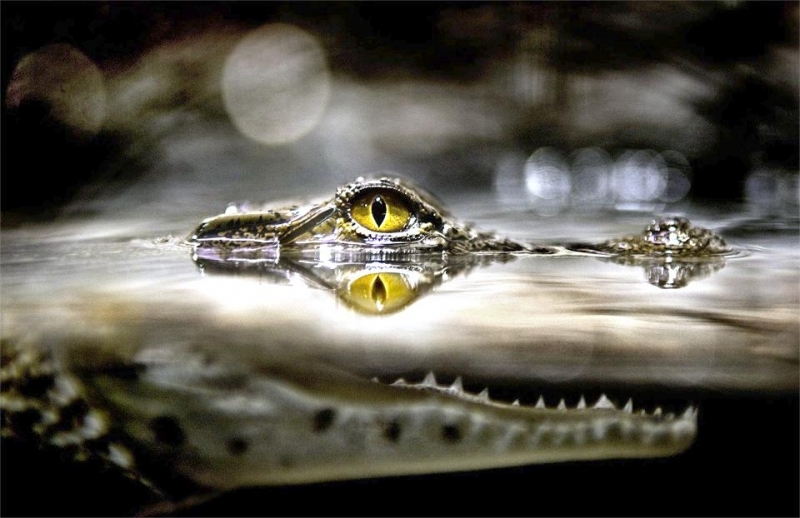 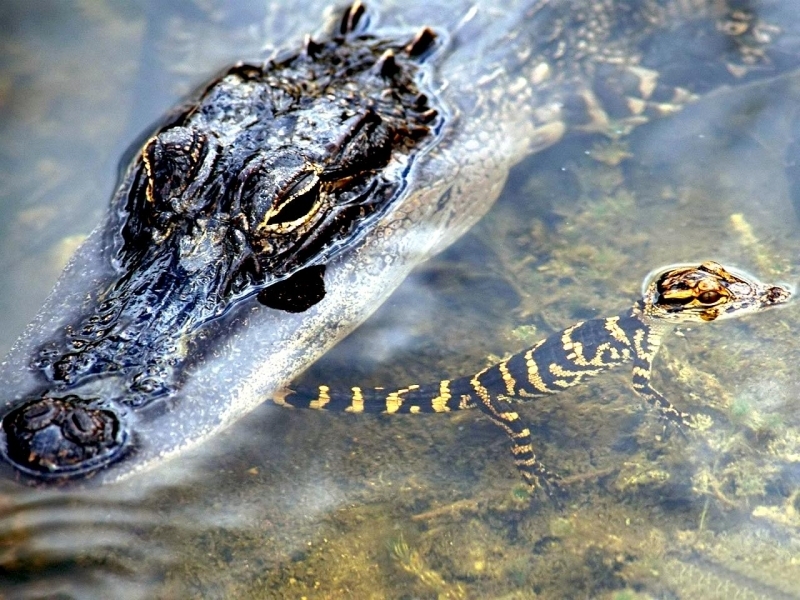 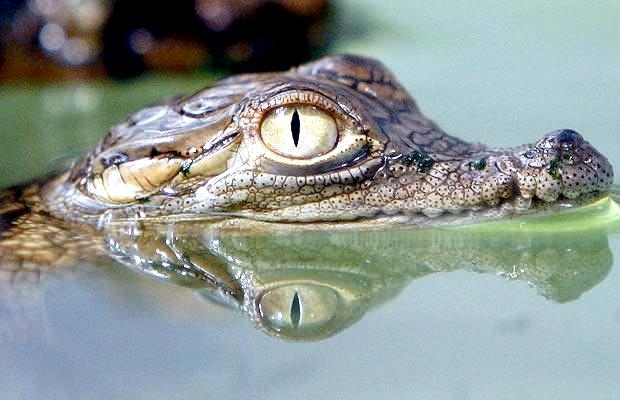 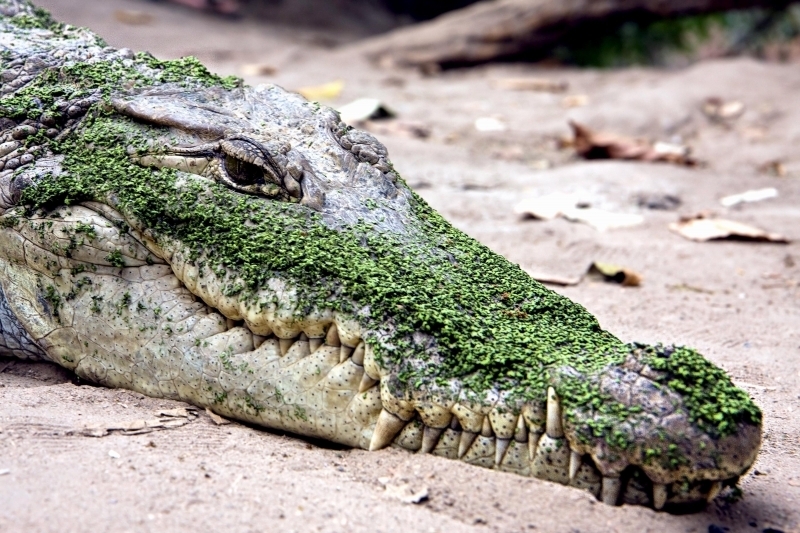 The Crocodile’s name comes from the ancient Greek krokodilos meaning “worm of the pebbles”. 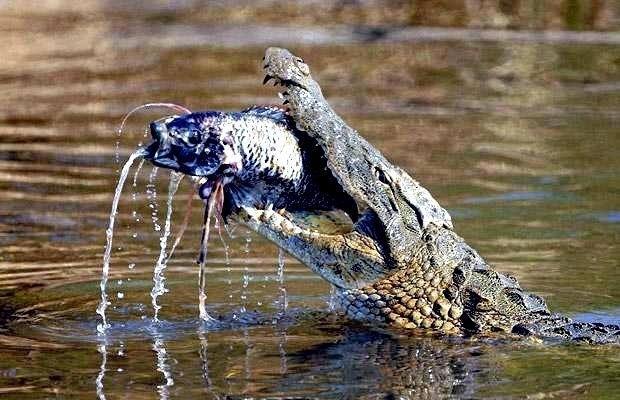 Why they thought this was a good name instead of something like “monster lizard of the water” is quite unclear. 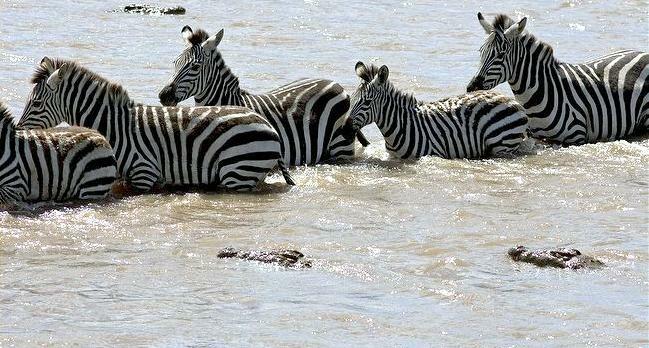 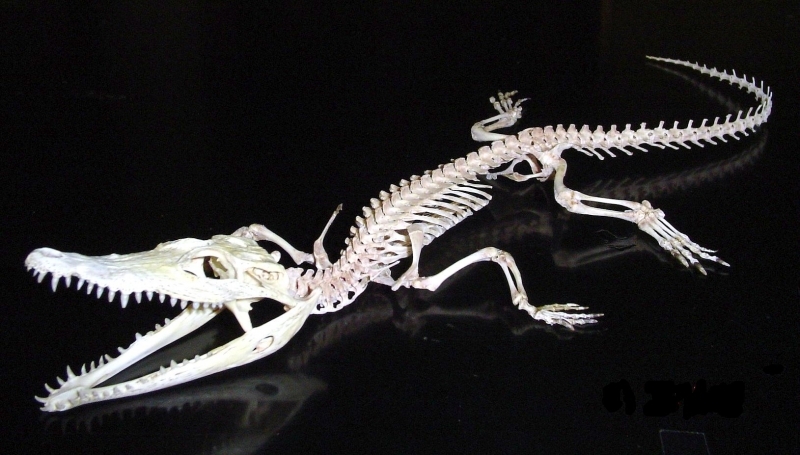 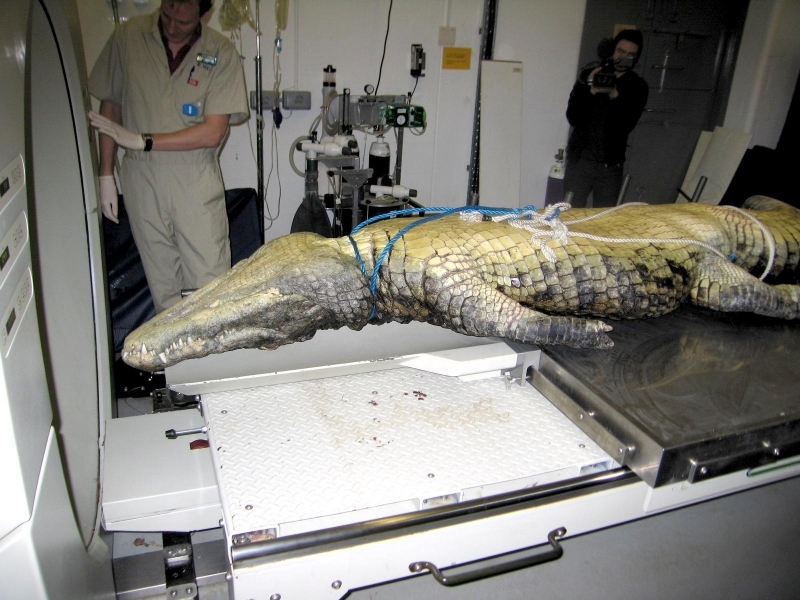 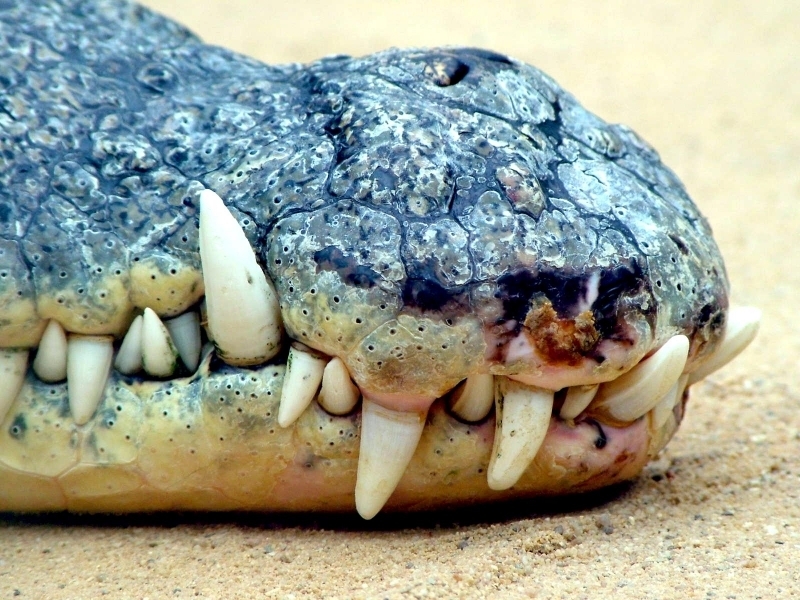 Maybe the Crocodile looked like a worm when it was first discovered and the name stuck. 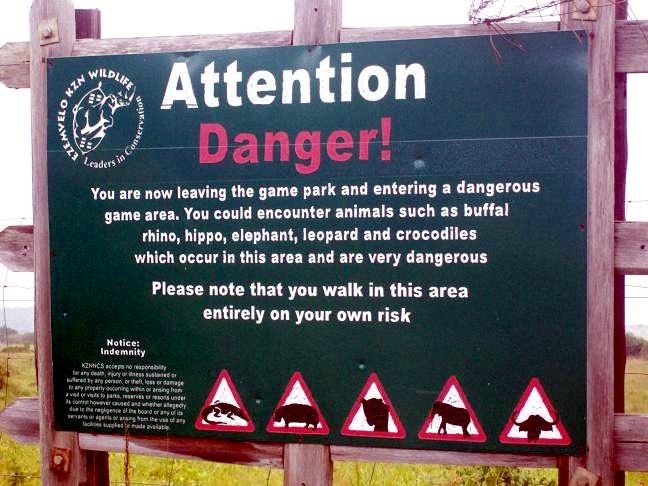 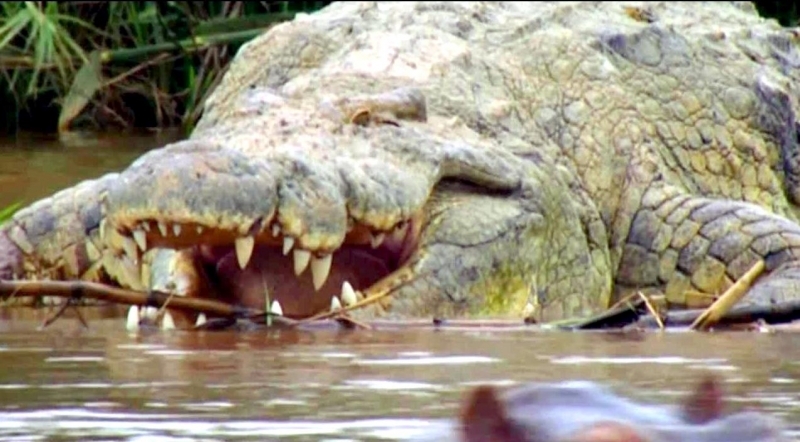 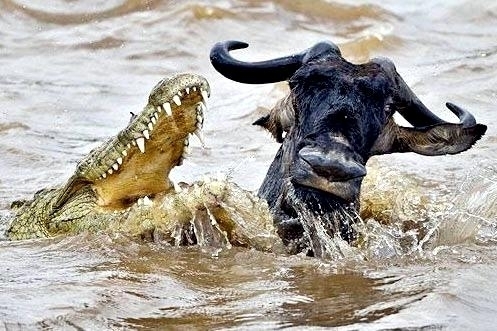 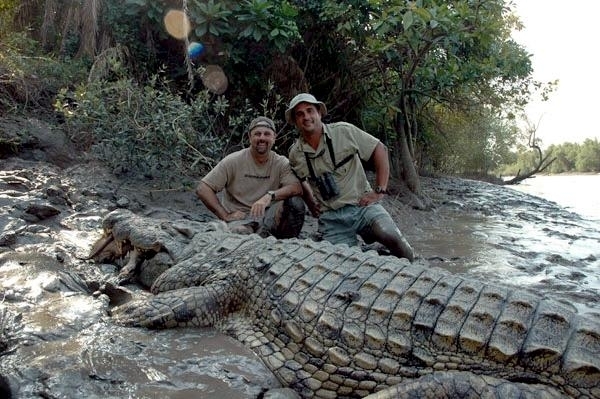 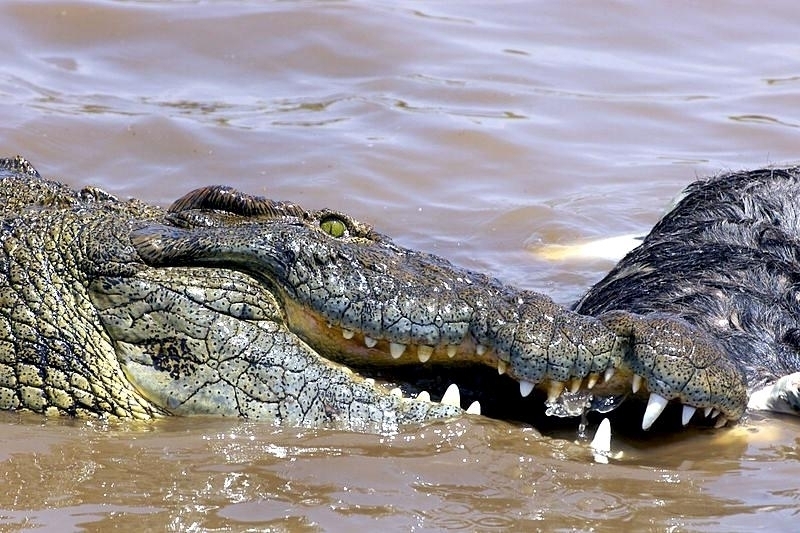 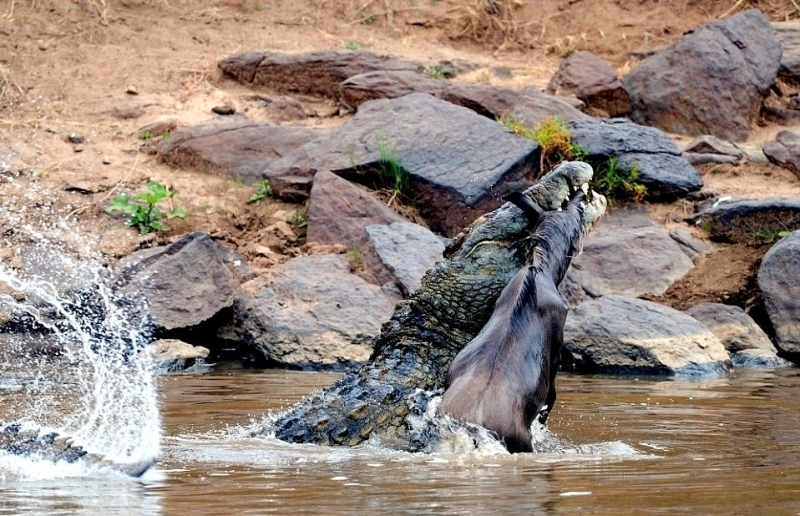 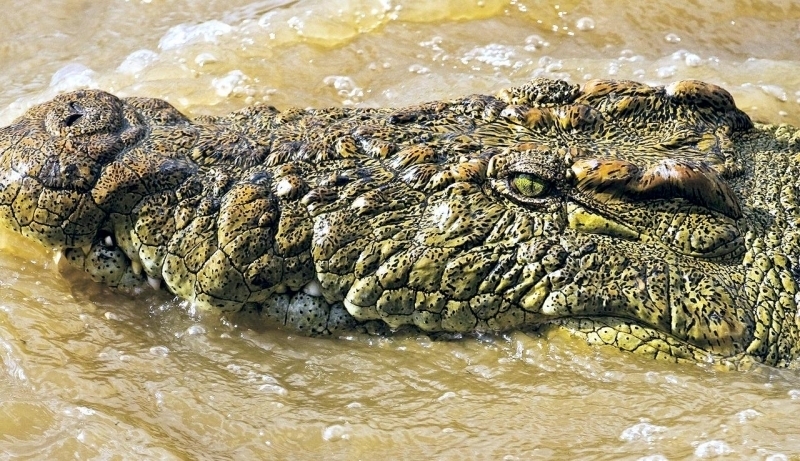 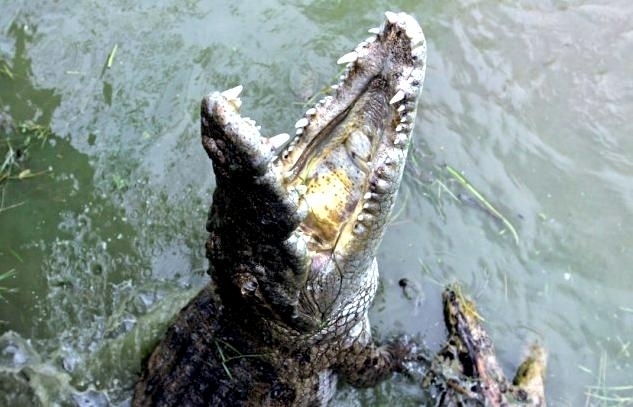 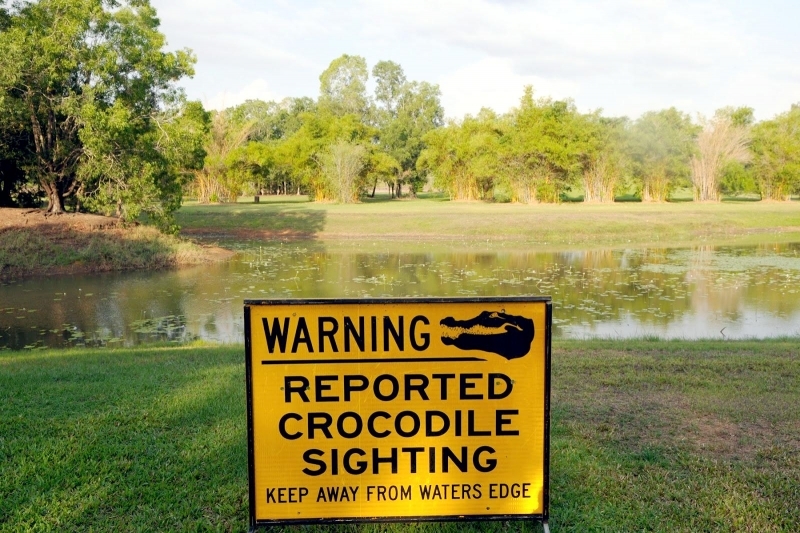 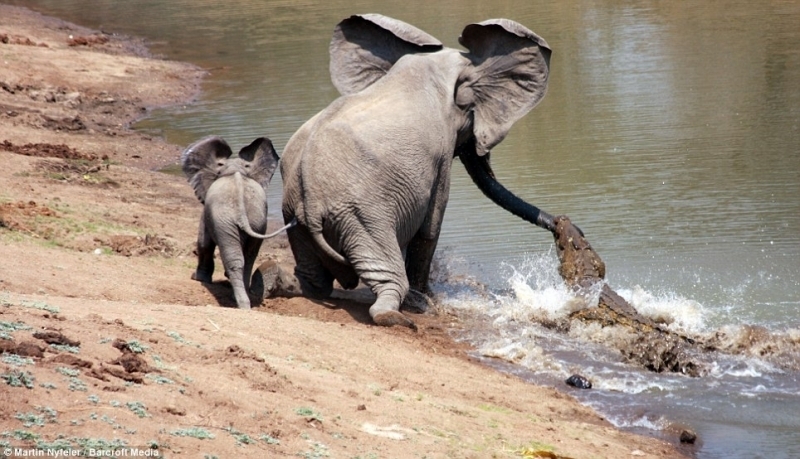 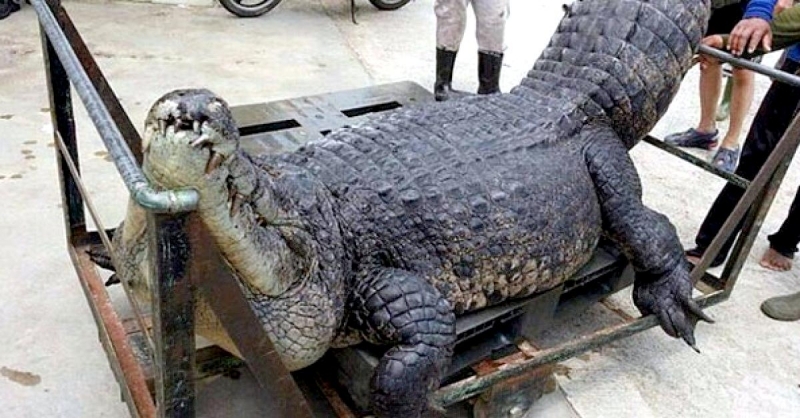 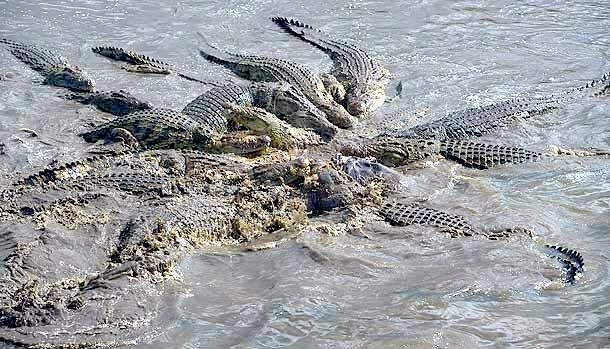 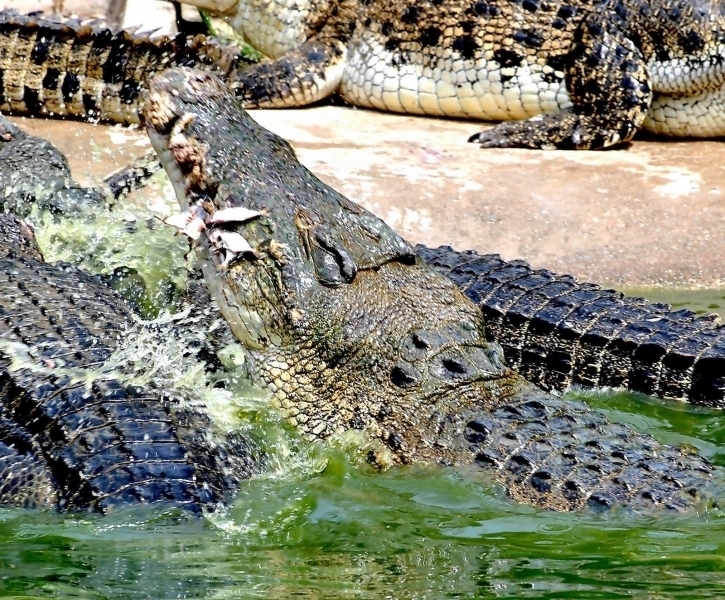 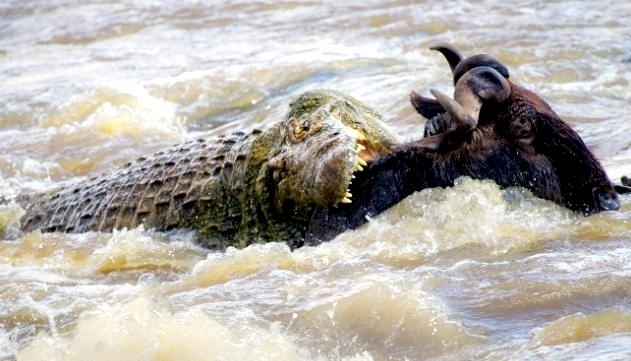 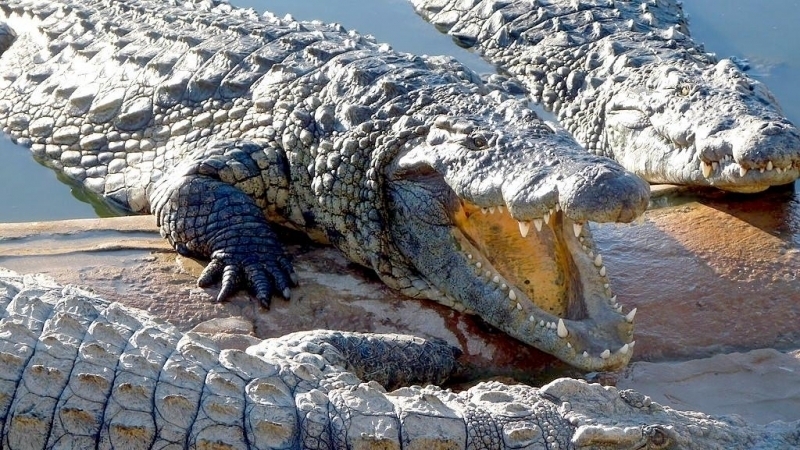 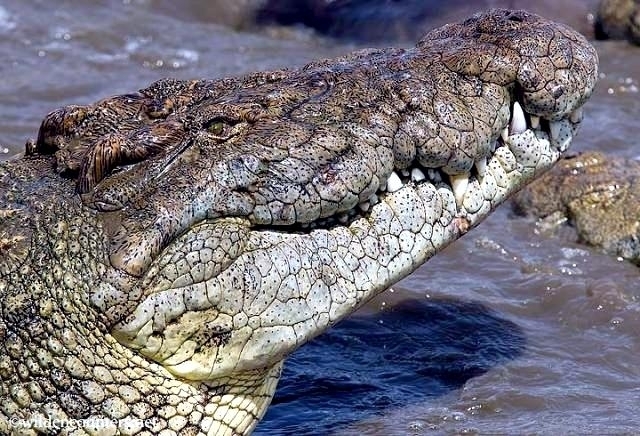 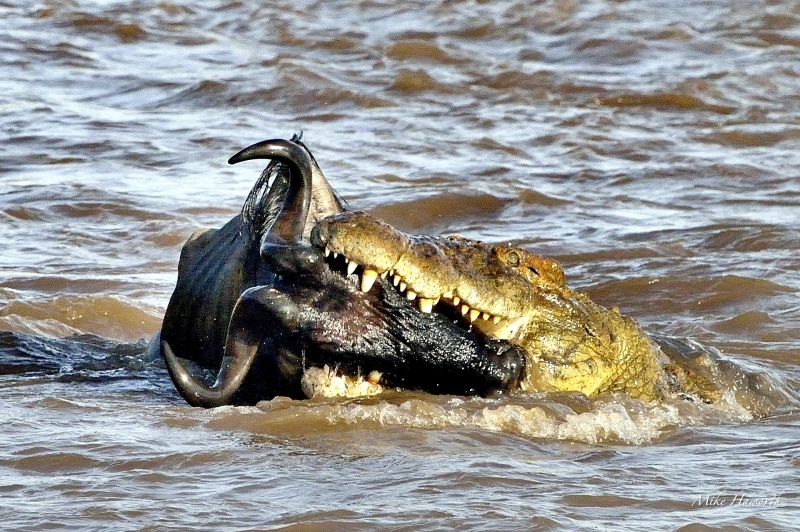 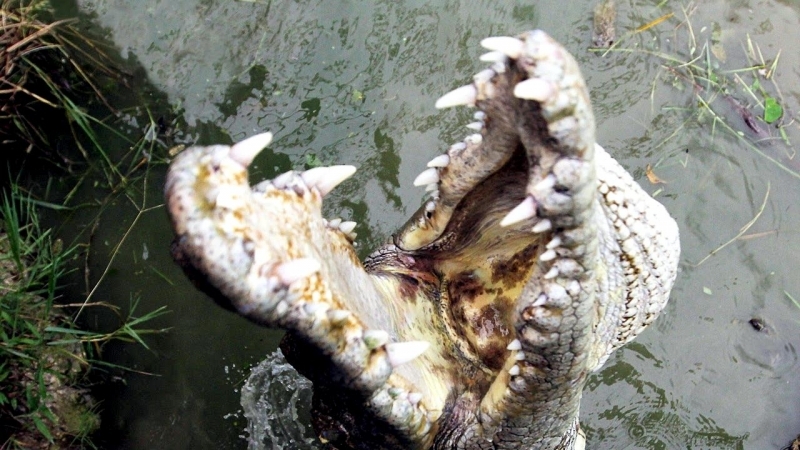 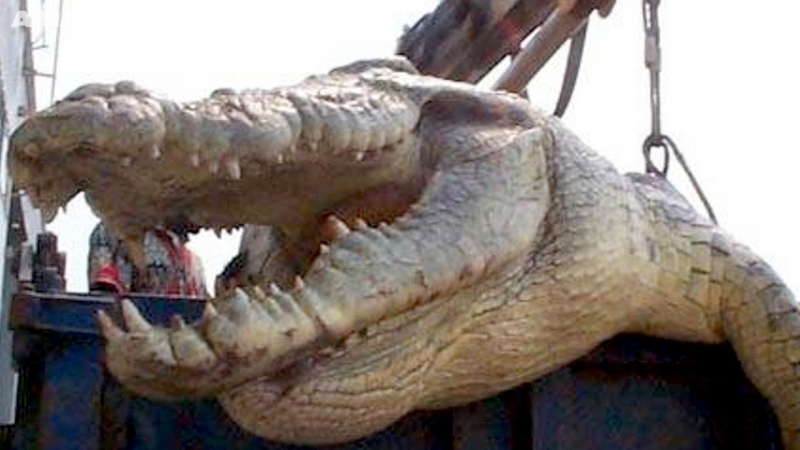 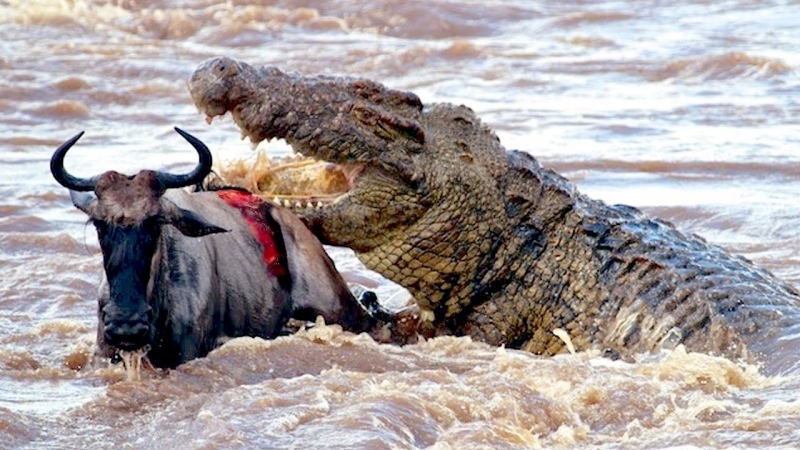 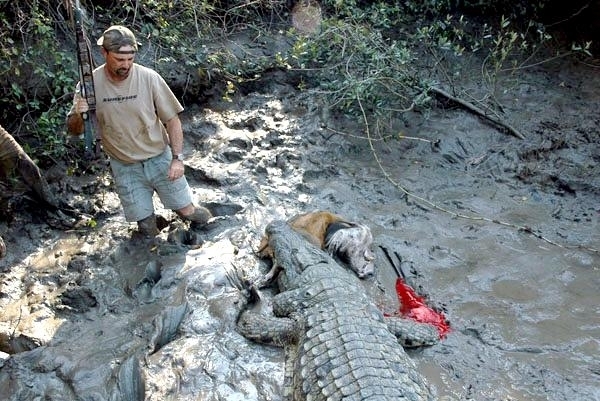 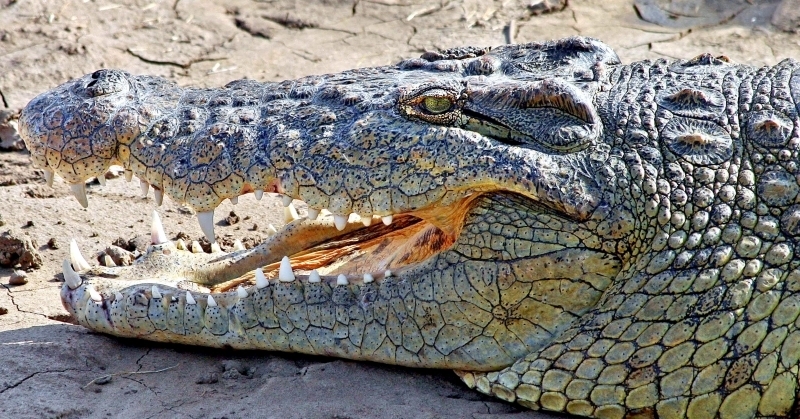 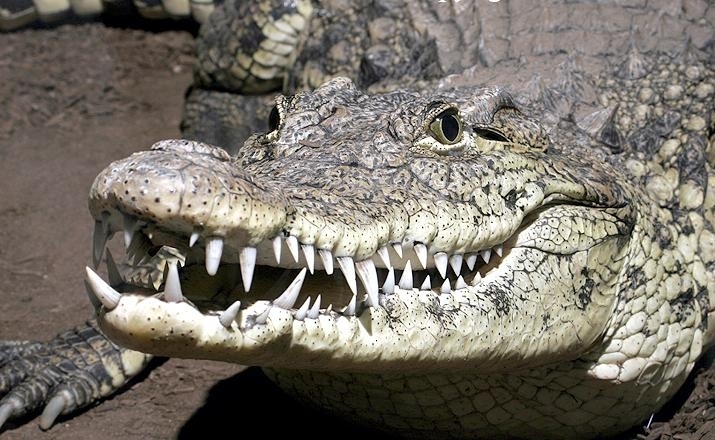 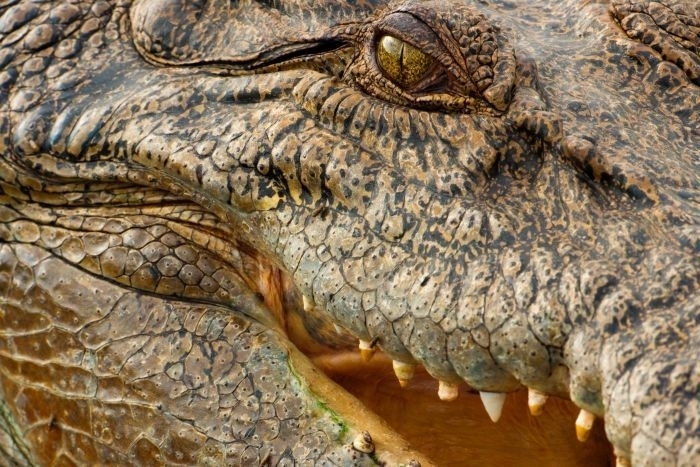 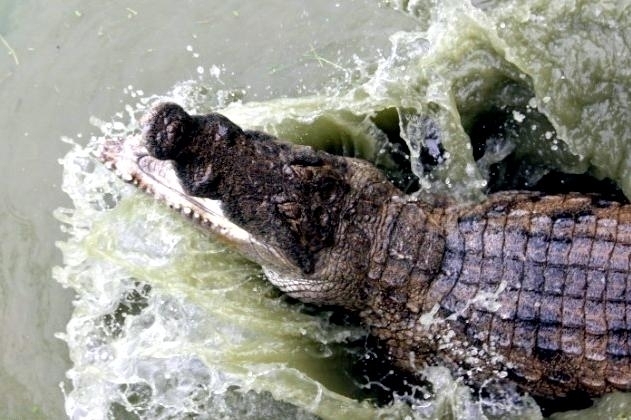 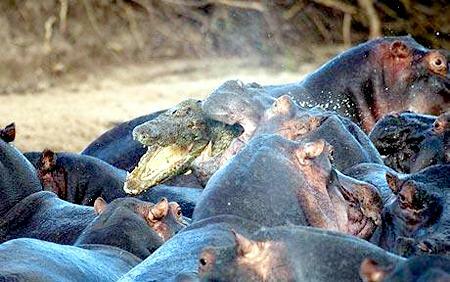 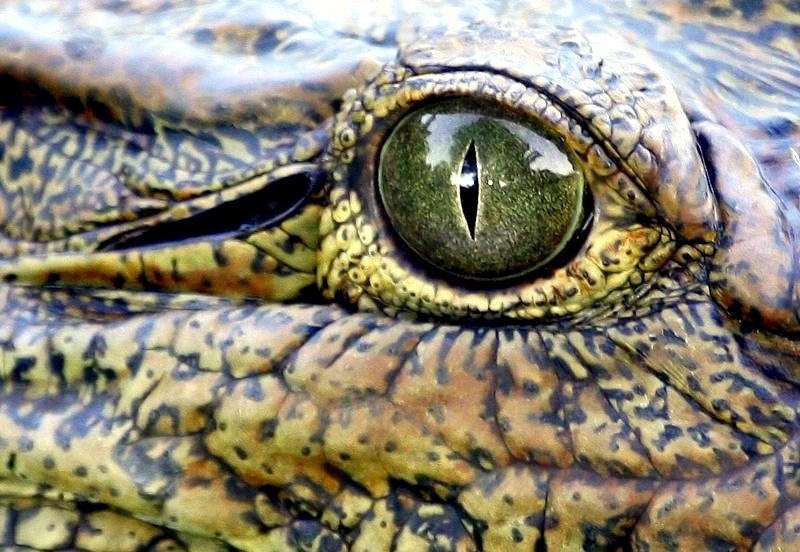 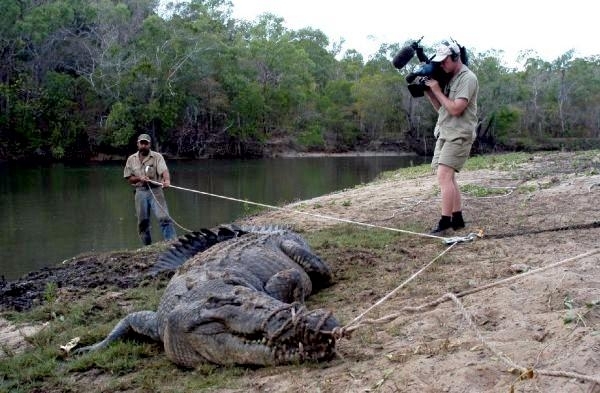 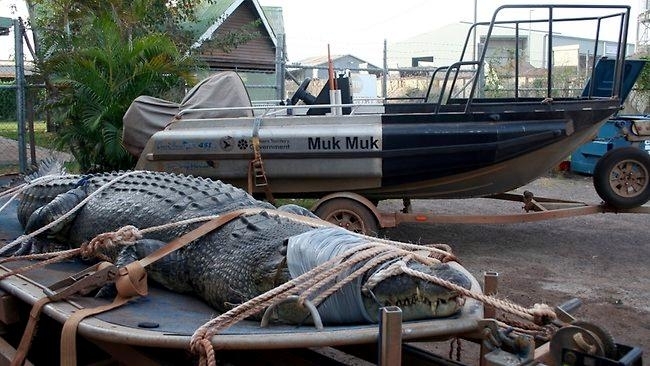 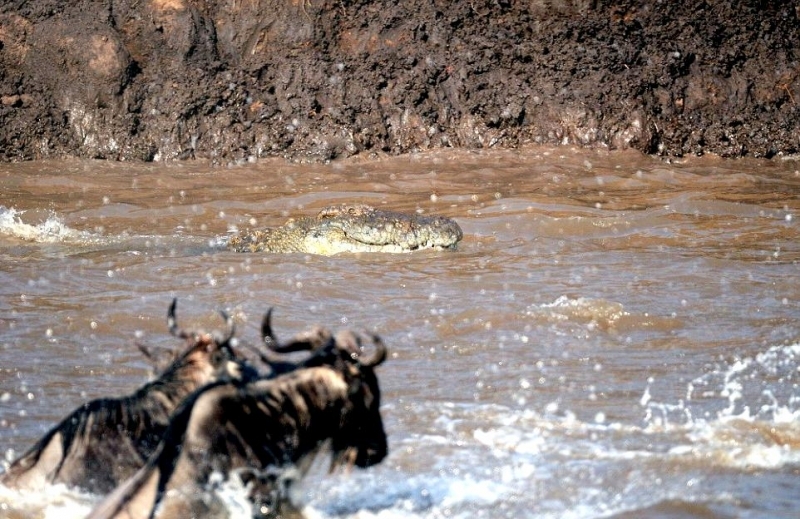 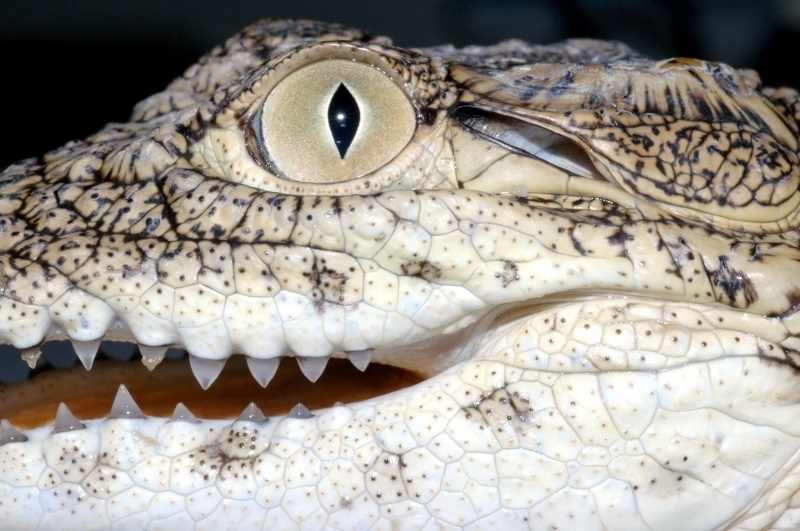 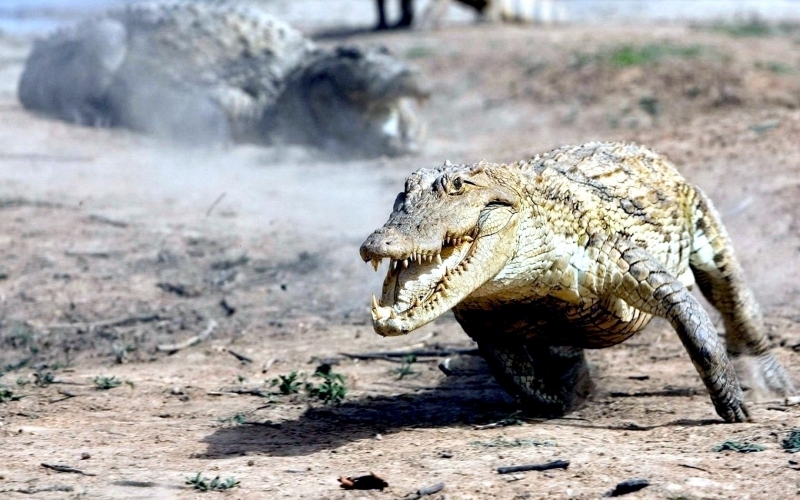 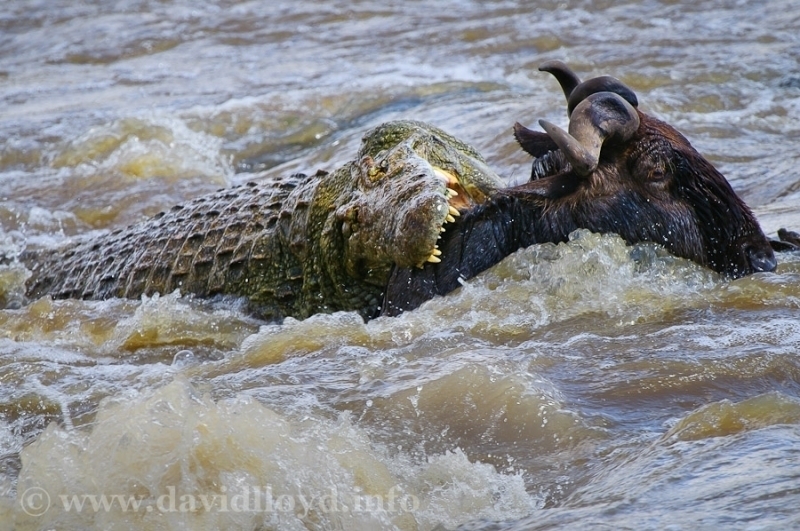 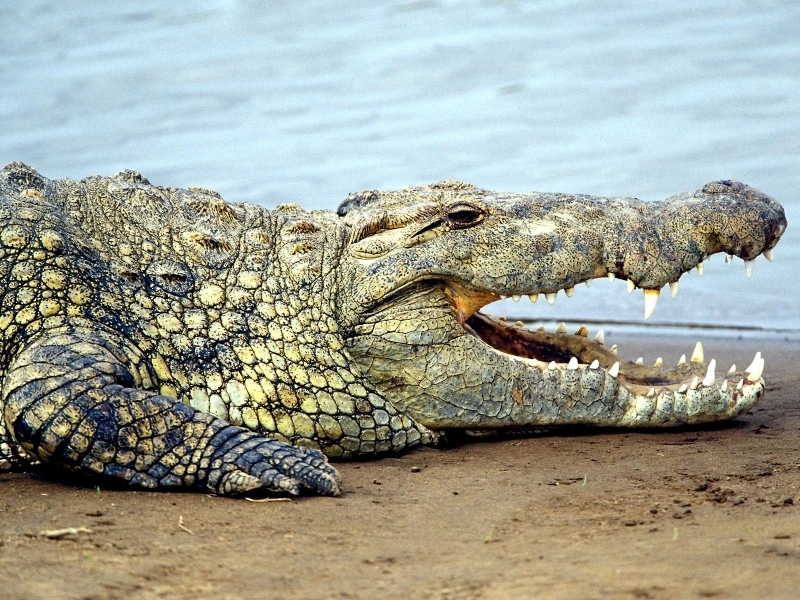 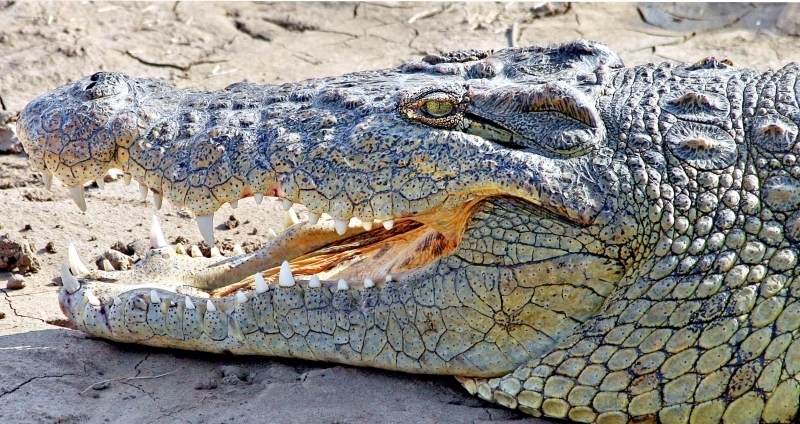 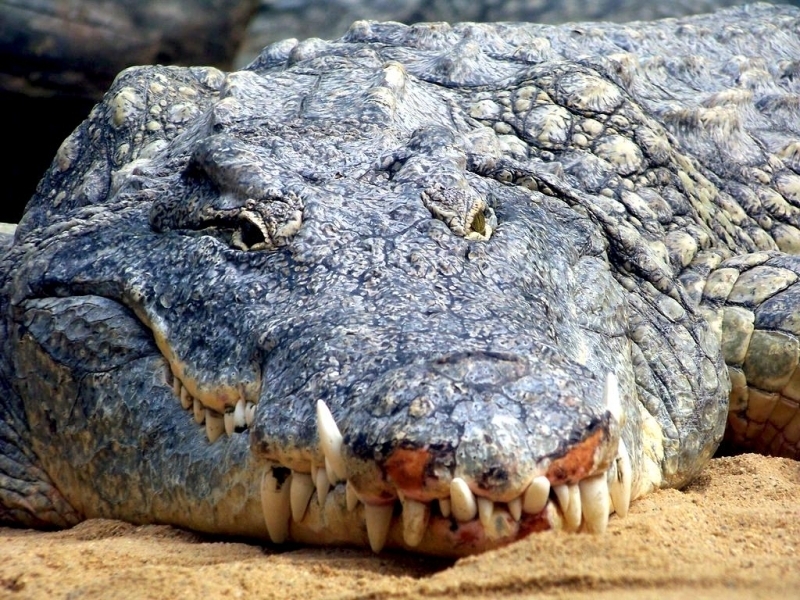 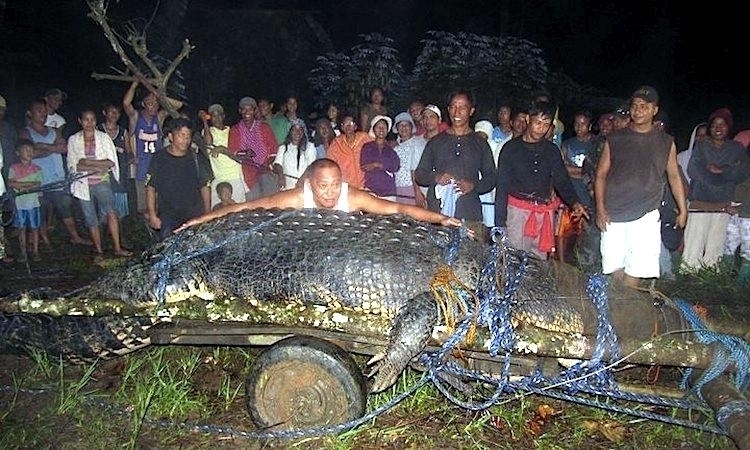 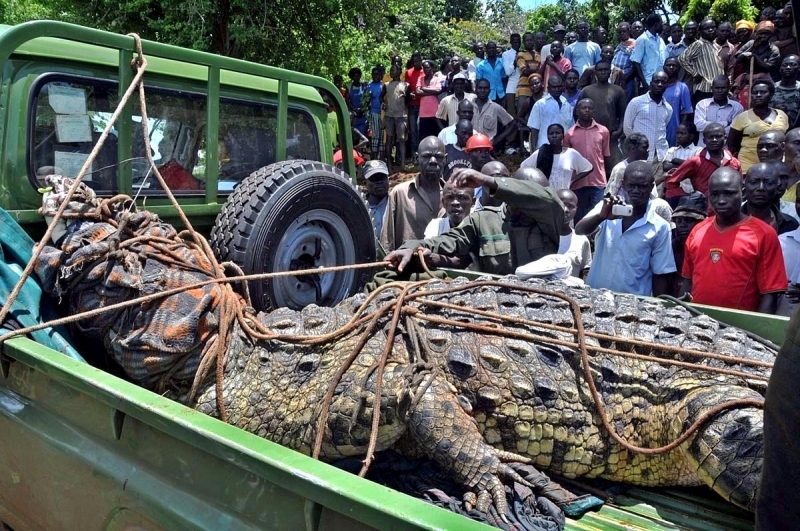 Firm numbers are sketchy, but estimates are that up to 200-300 people may die each year in the jaws of a Nile Crocodile. 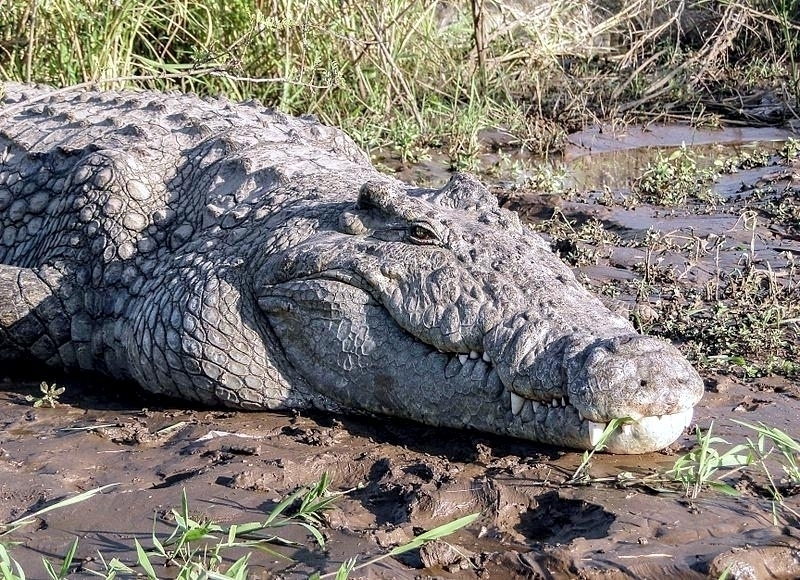 As Africa’s largest crocodilian, these primordial brutes reach a maximum size of about 20 feet (6 meters) and can weigh up to 1,650 pounds (730 kilograms). 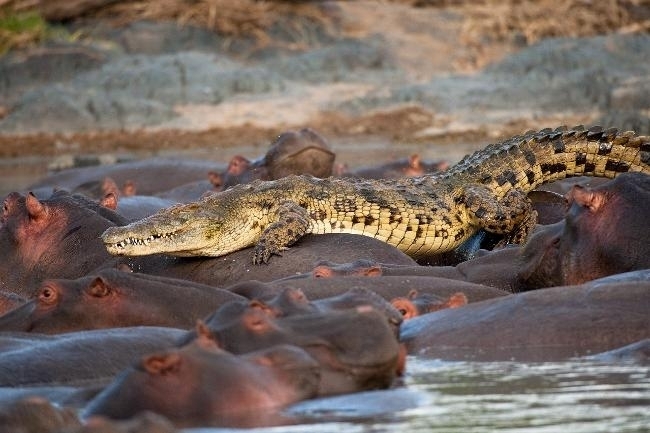 Average sizes though, are more in the range of 16 feet (5 meters) and 500 pounds (225 kilograms). 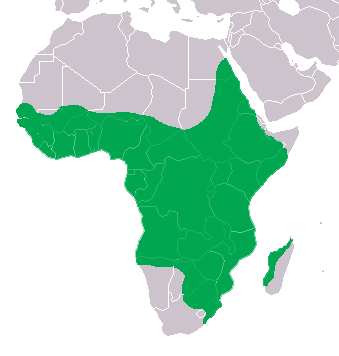 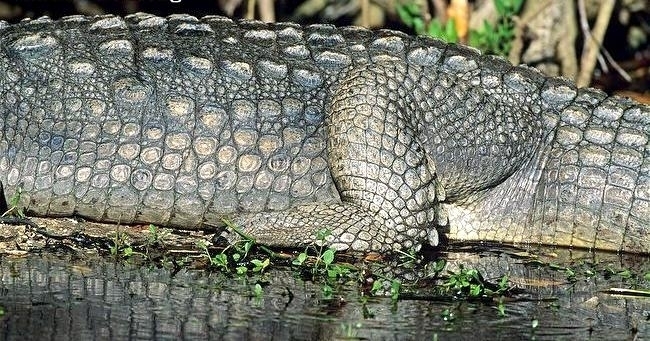 They live throughout sub-Saharan Africa, the Nile Basin and Madagascar in rivers, freshwater marshes and mangrove swamps. 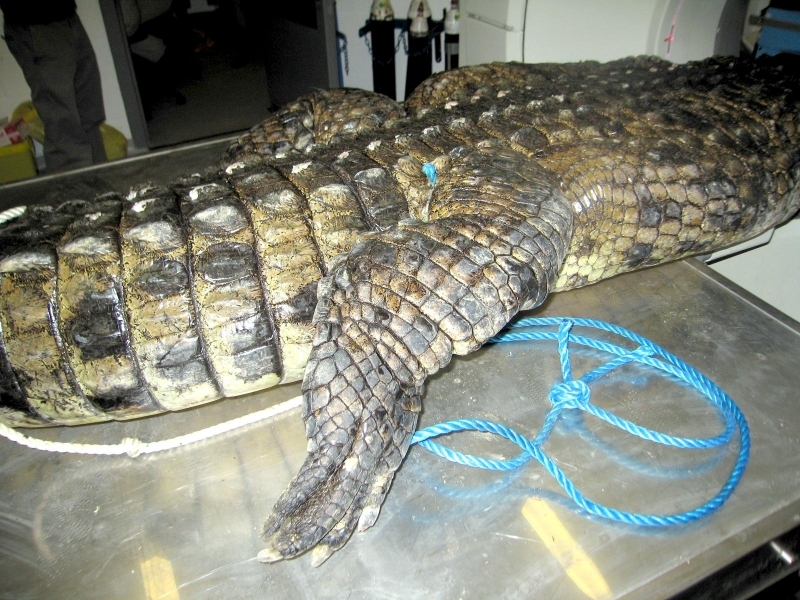 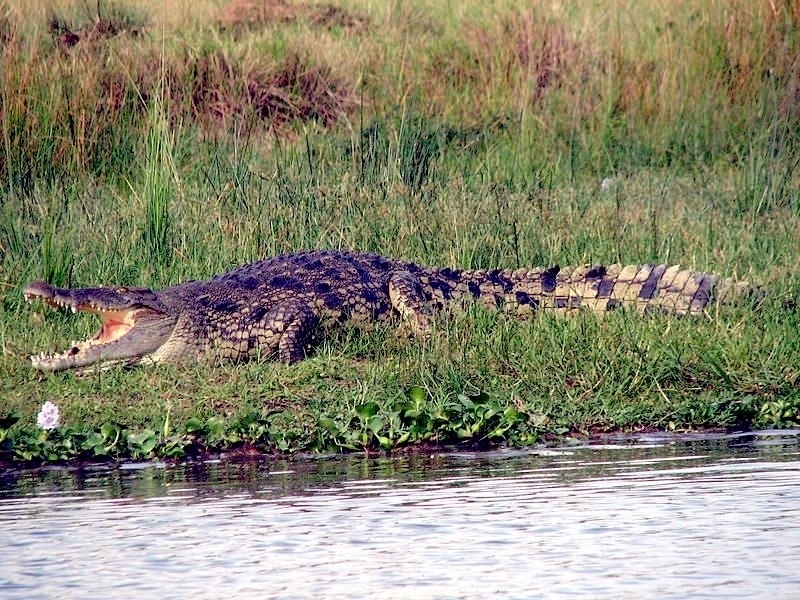 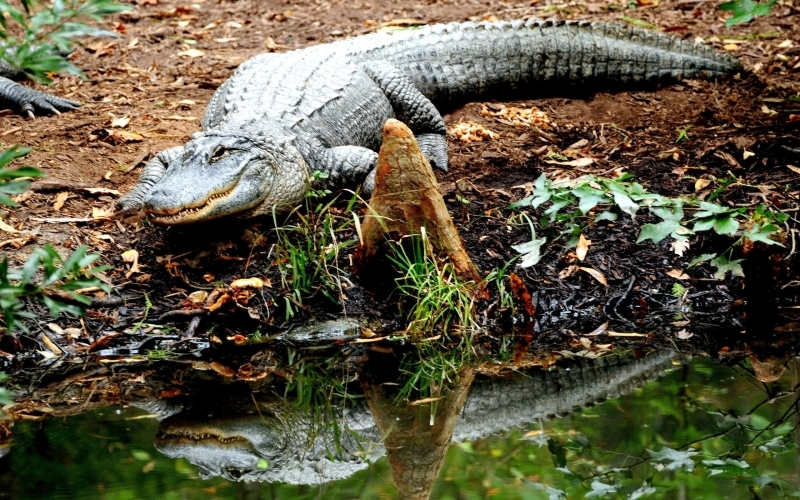 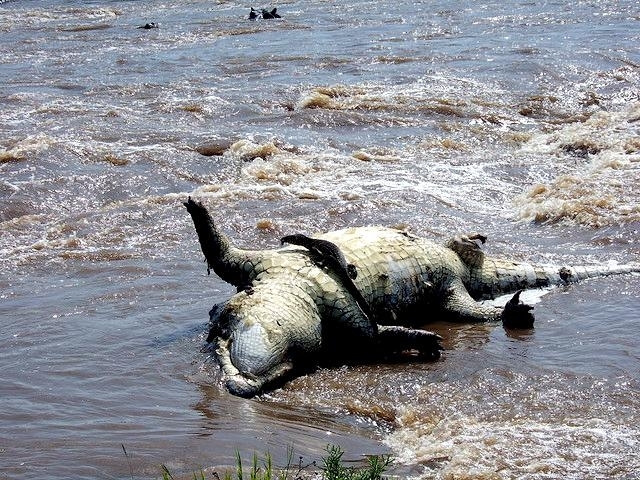 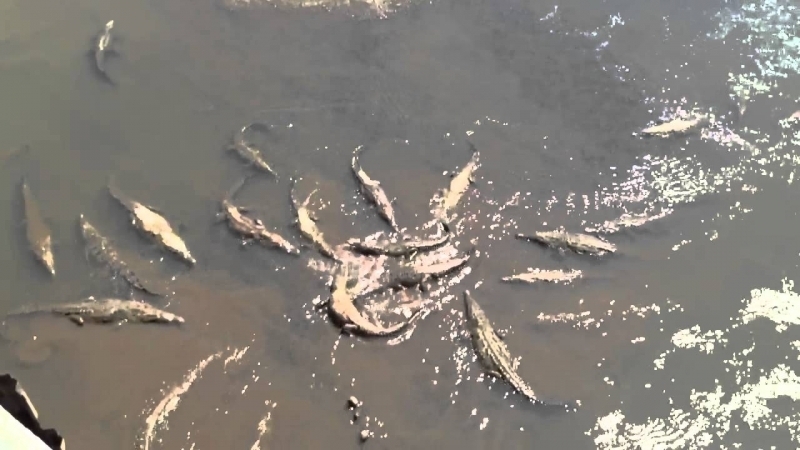 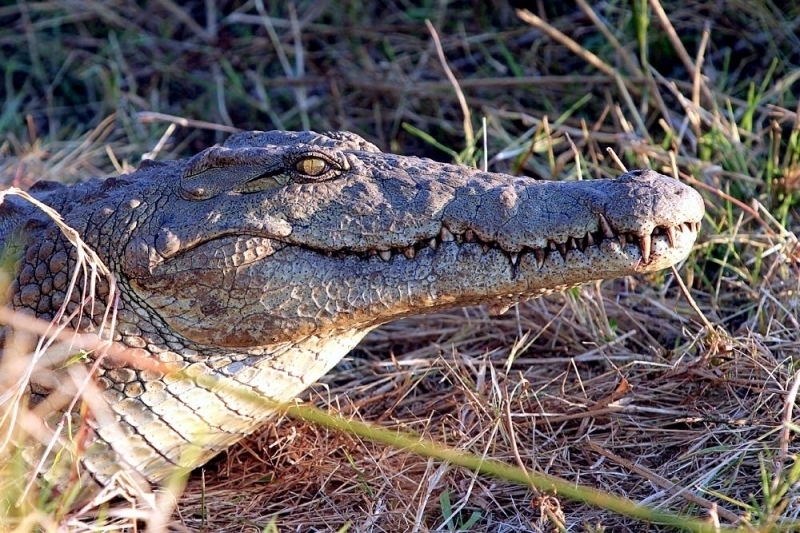 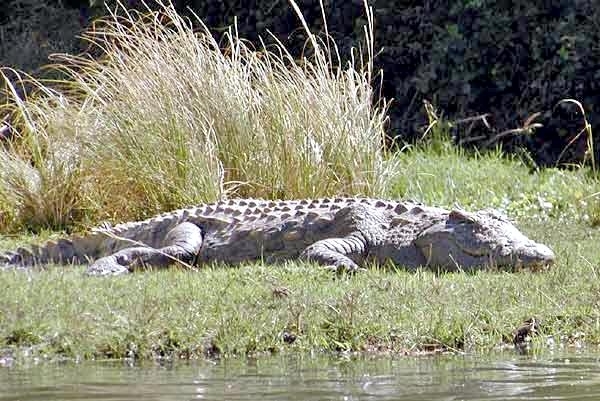 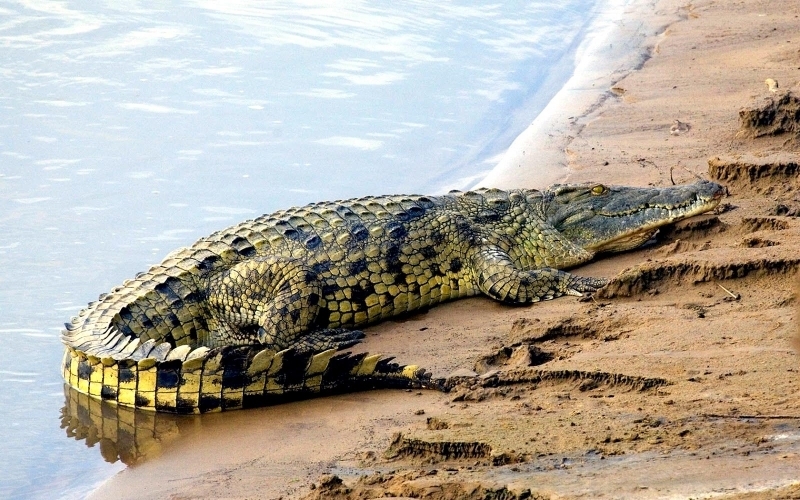 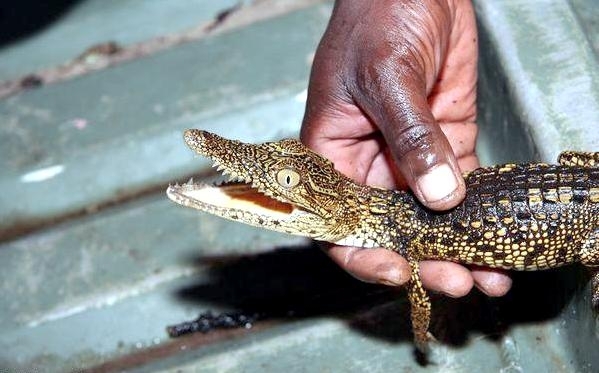 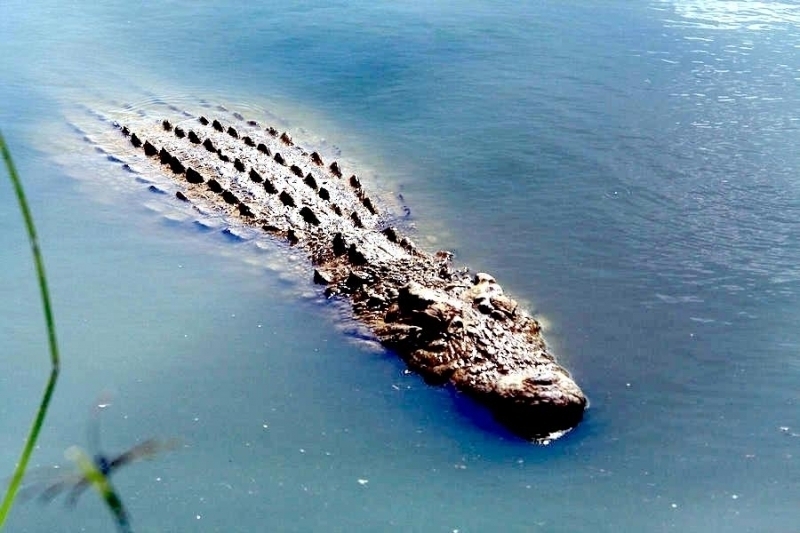 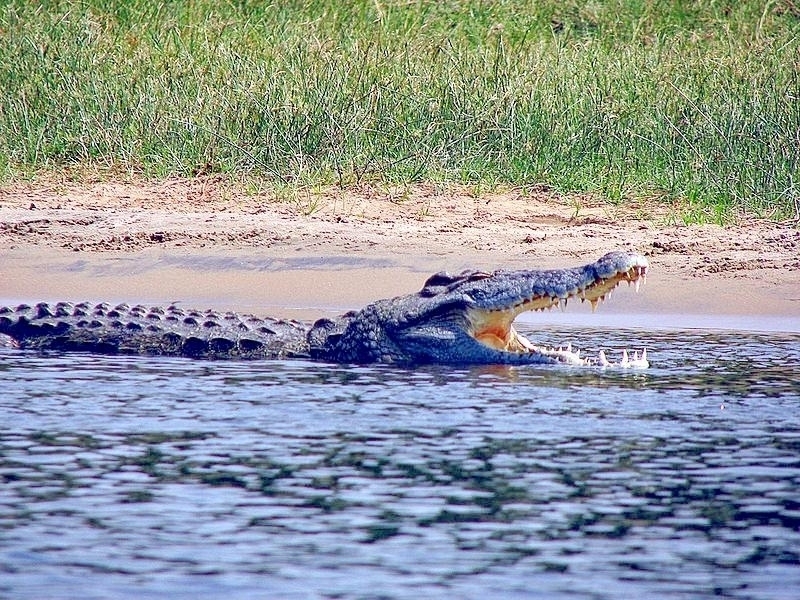 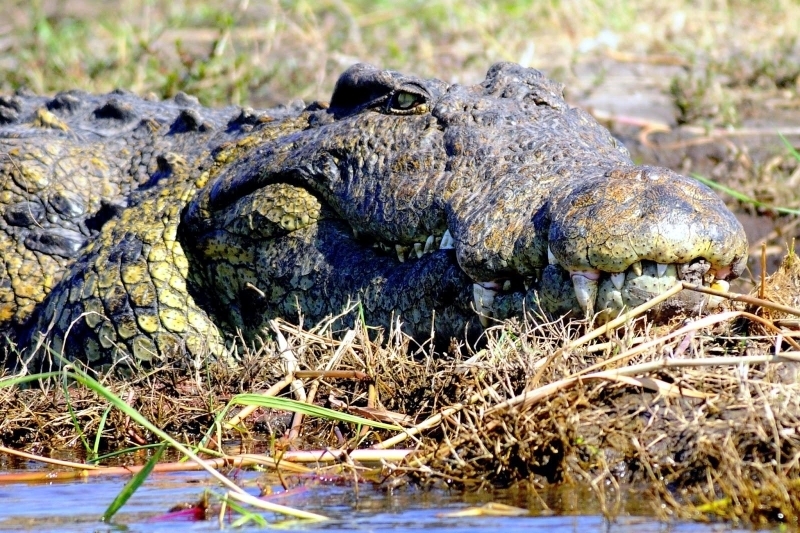 Currently there are an estimated 800,000 Nile Crocodiles alive in the wild with an estimated 4,000 in the Kruger National Park, about 1,900 in the Greater St. Lucia Wetland Park and an estimated 3,000 in the Ndumu Wildlife Conservation Area. 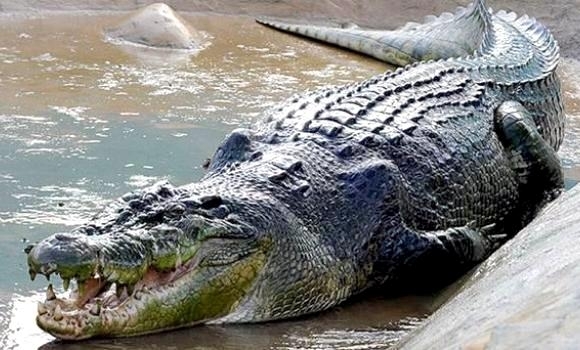 These creatures emerged from their dinosaur antecedents some 200 million years and in their present form dates back about 80 million years. 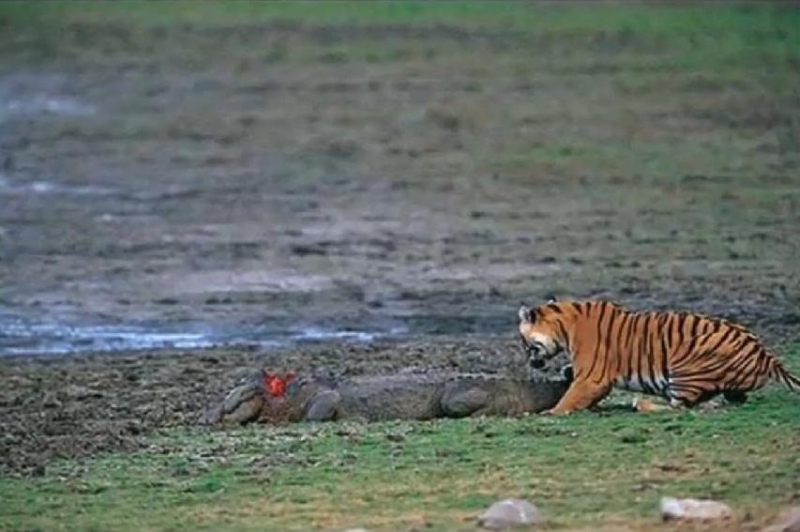 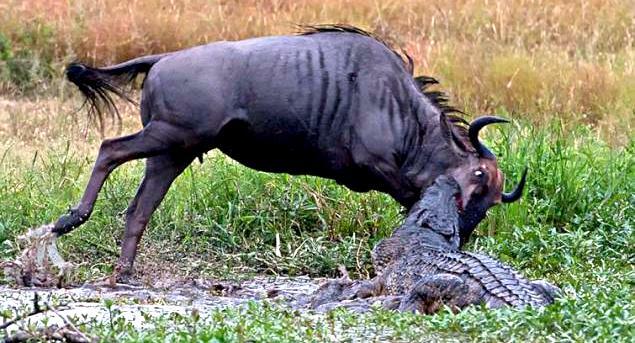 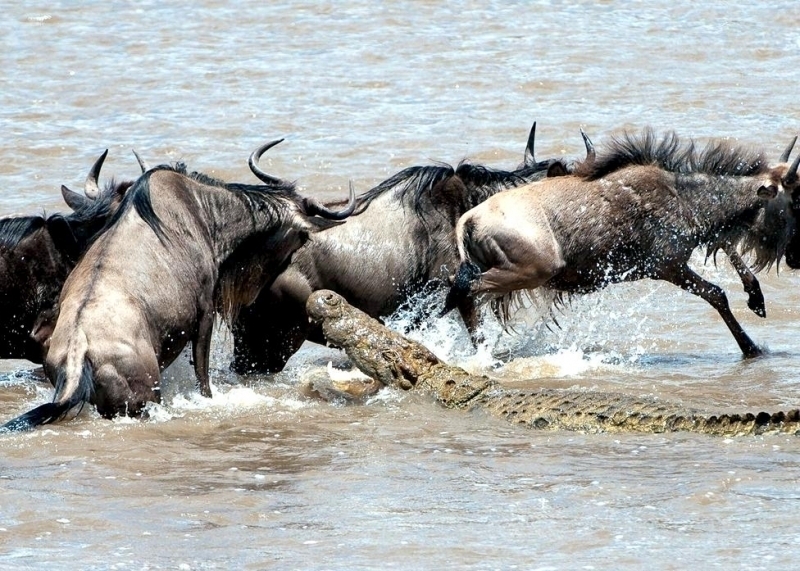 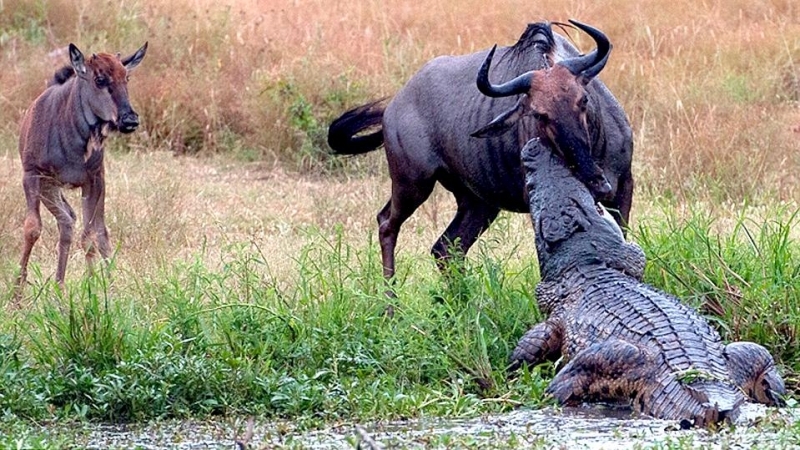 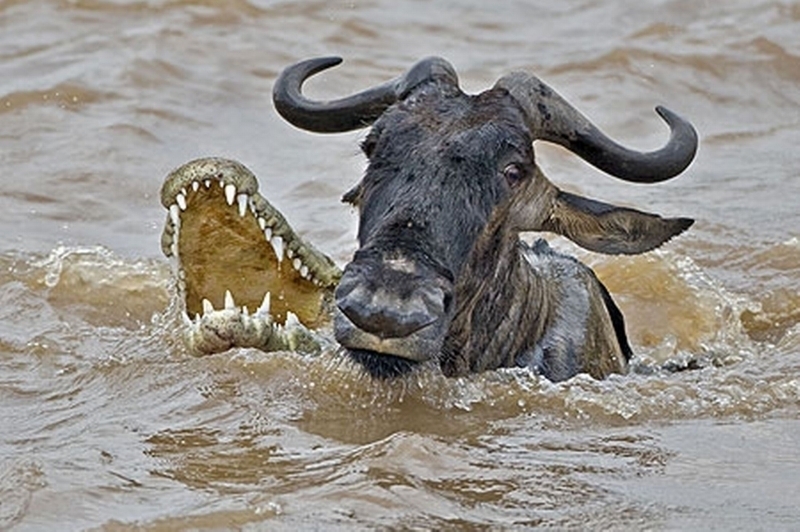 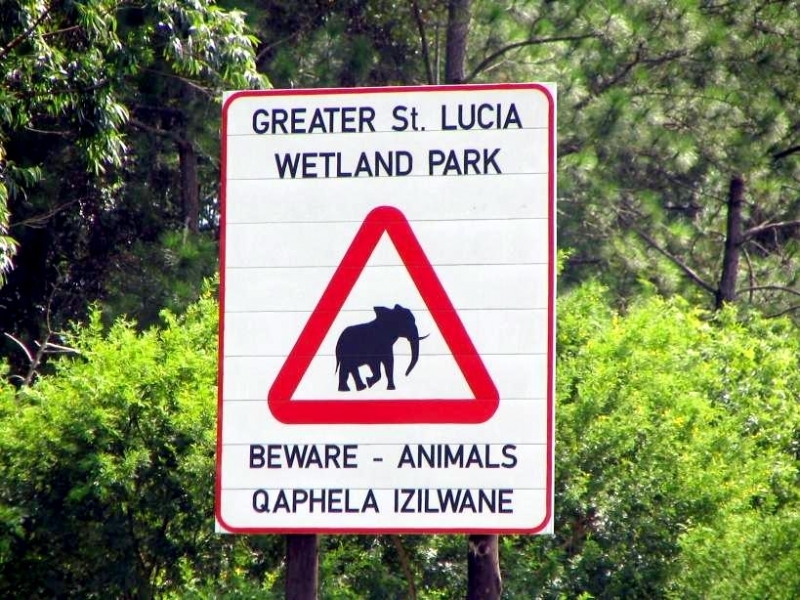 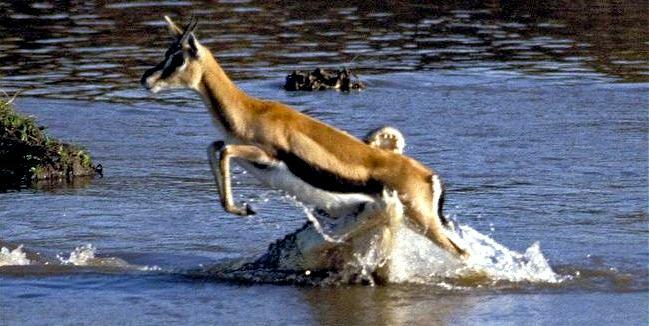 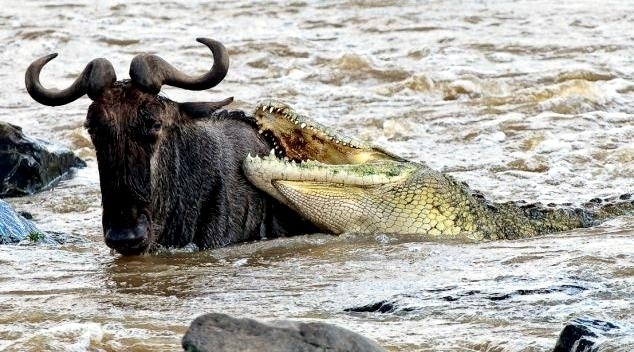 They are vicious man-eaters and will kill anything from fish to a full-grown Water Buffalo. 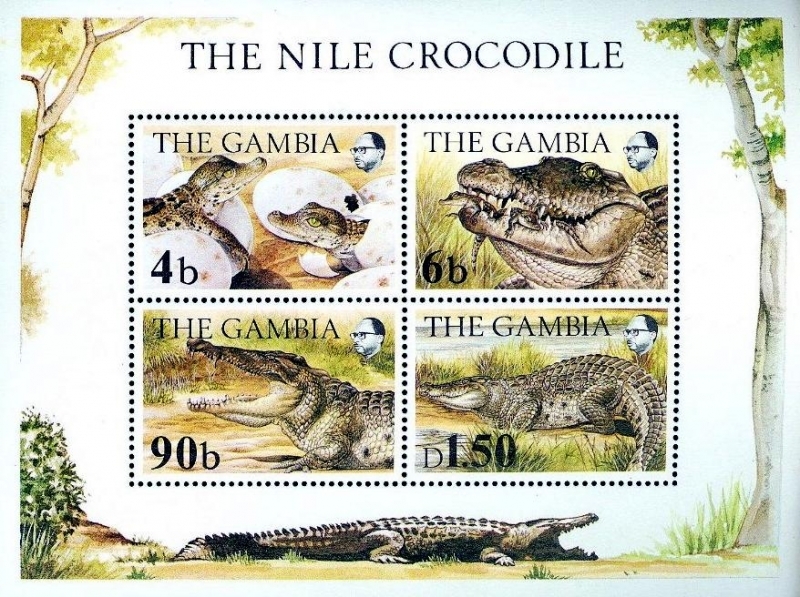 In the late 1950’s, the Nile Crocodile was classified as an endangered species and its hunting was prohibited. 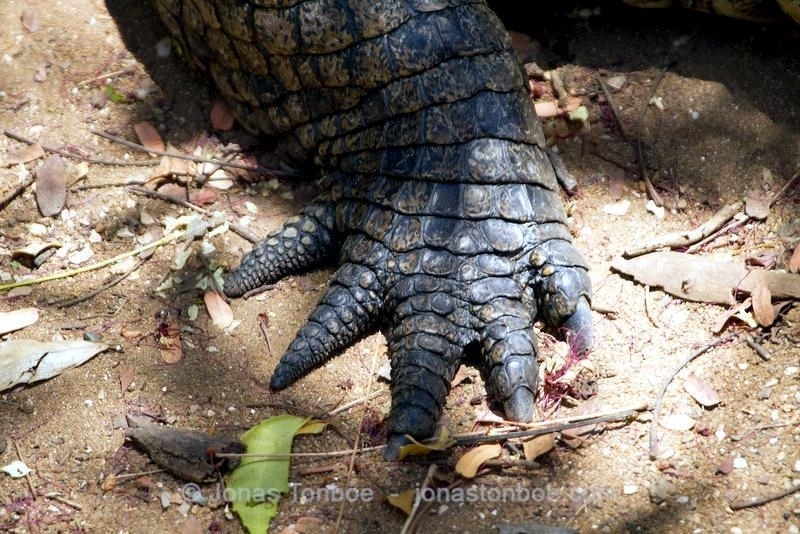 The name Crocodylus niloticus is derived from the Greek kroko (pebble) referring to its rough skin, deilos (worm) and niloticus from the Nile River. 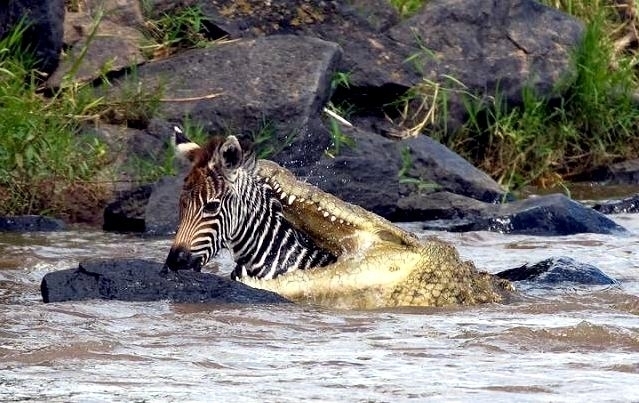 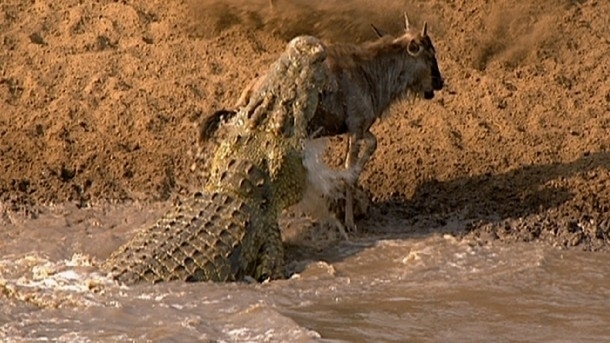 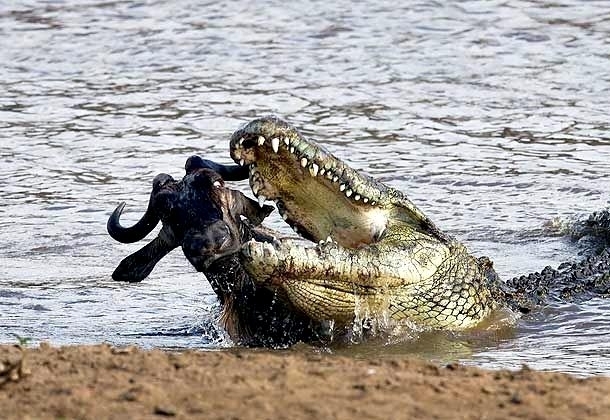 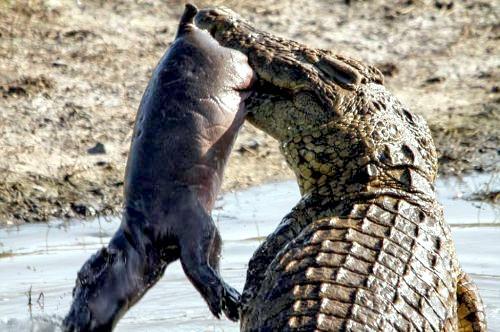 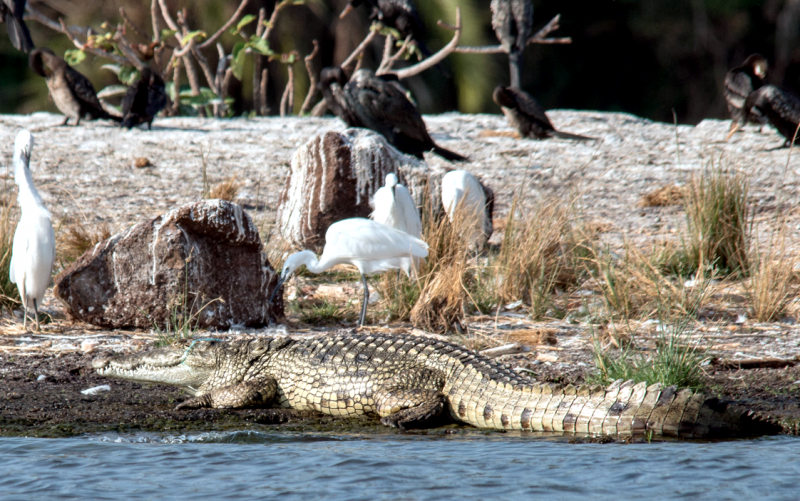 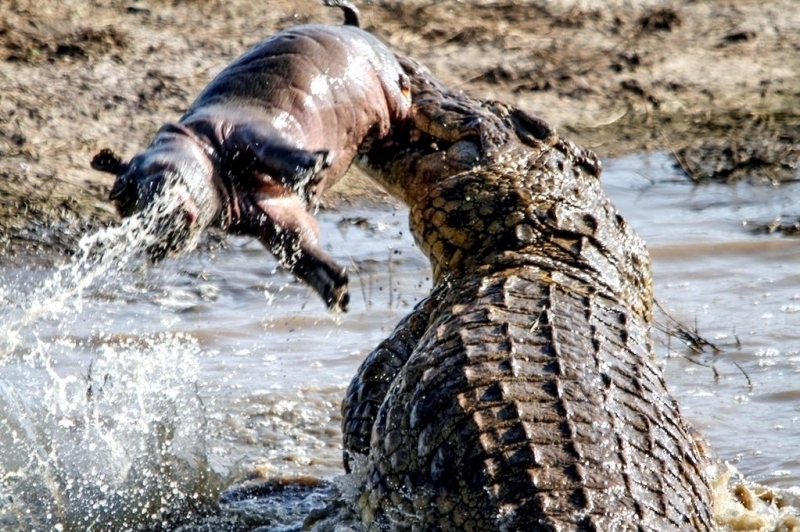 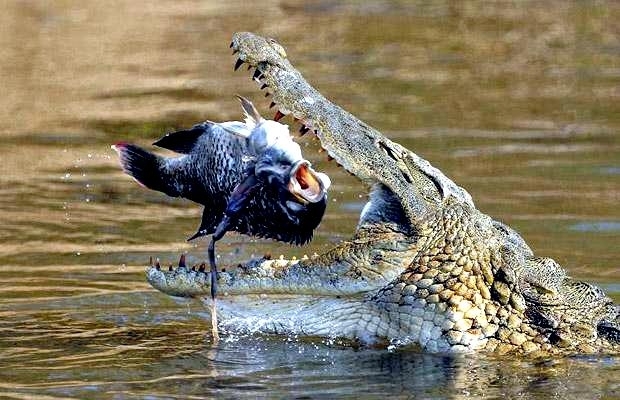 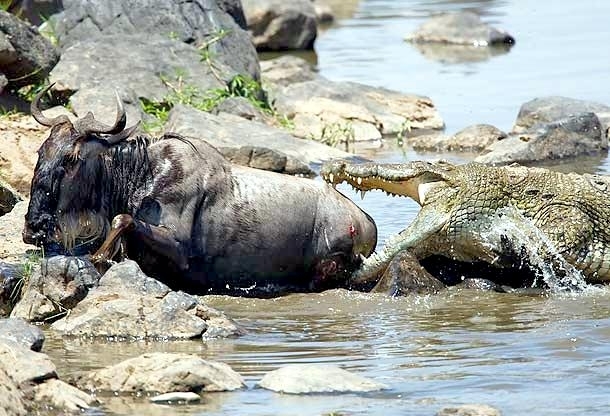 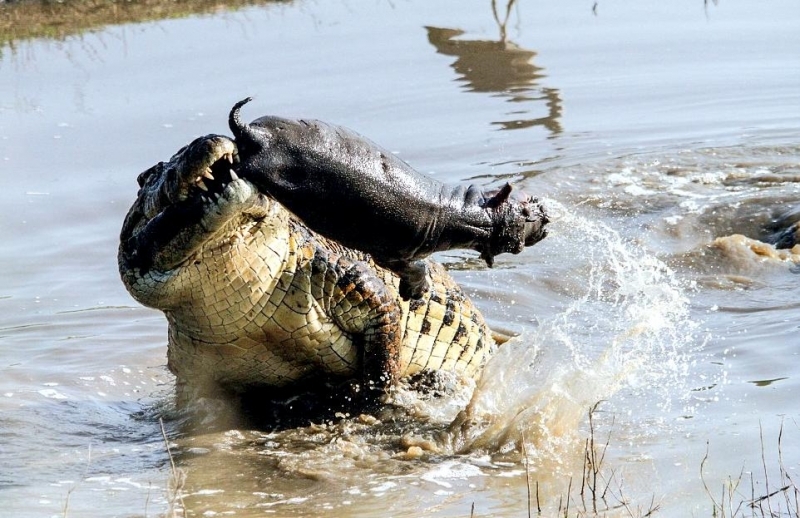 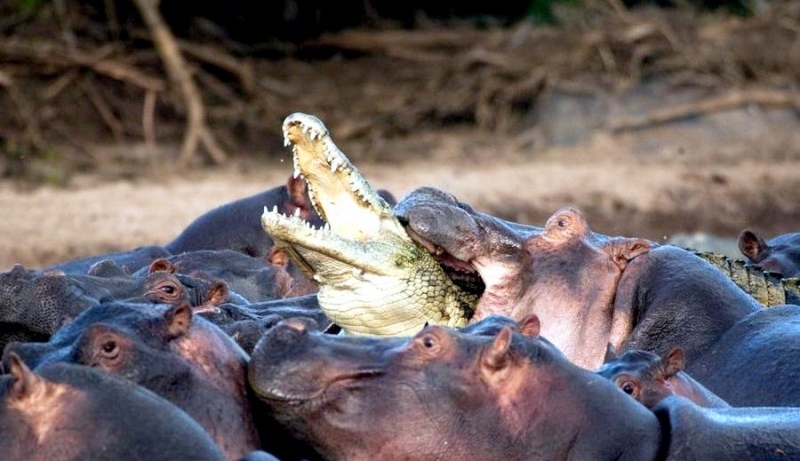 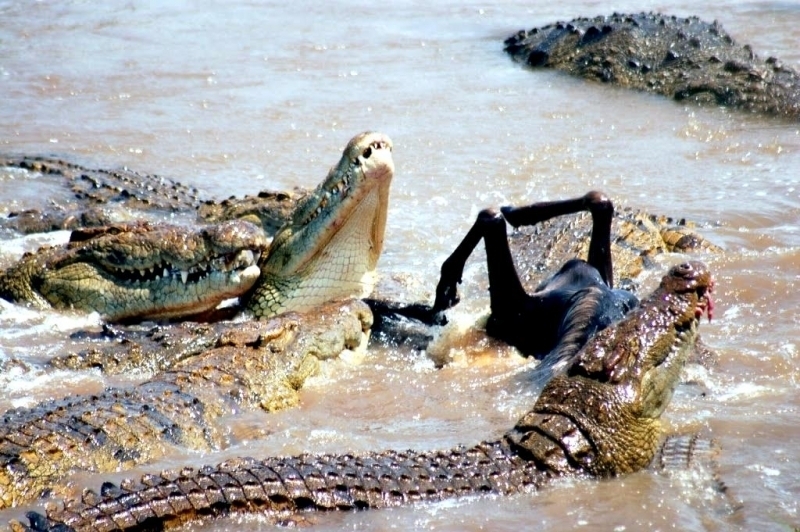 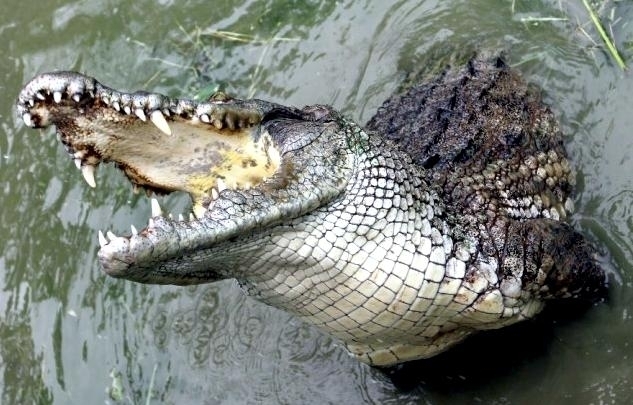 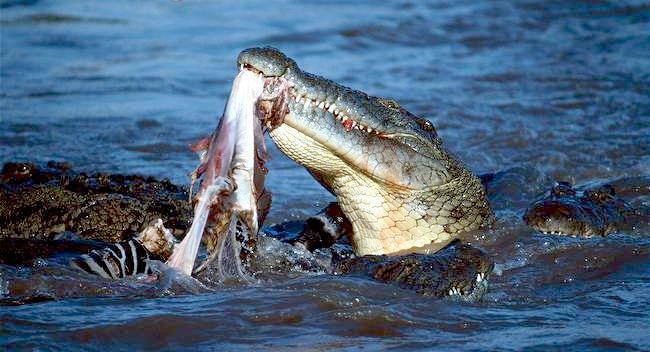 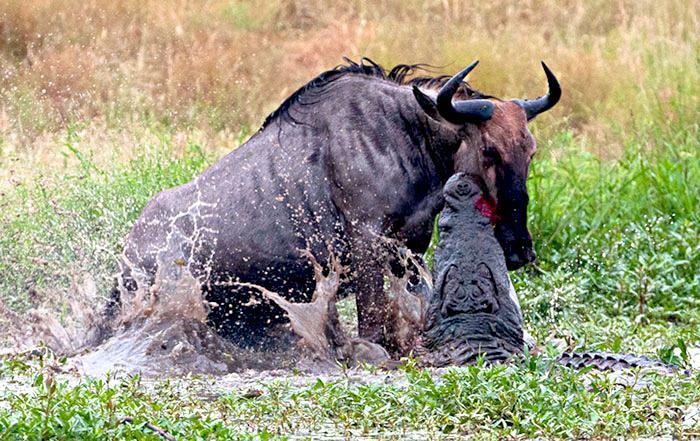 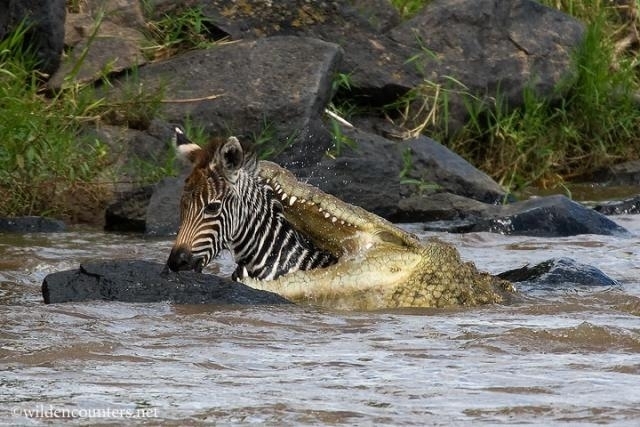 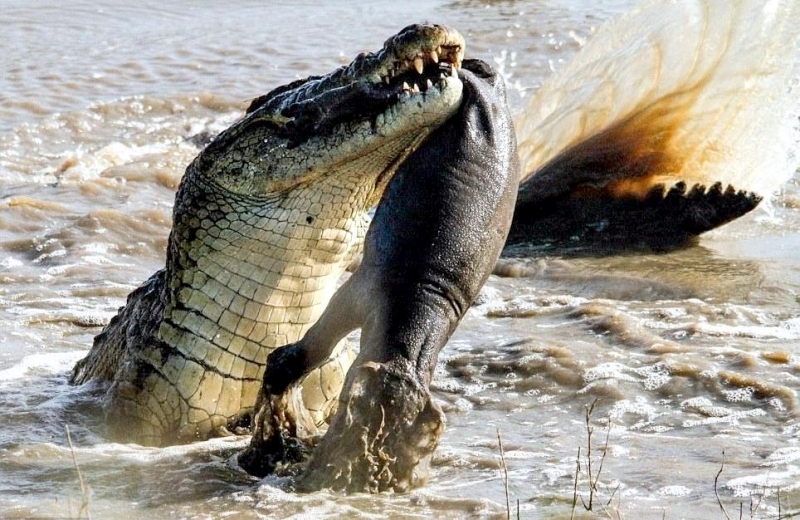 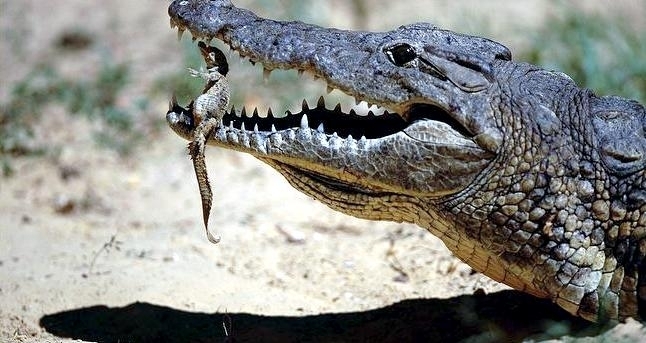 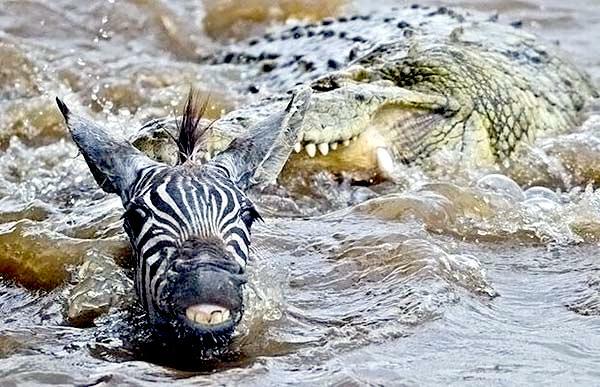 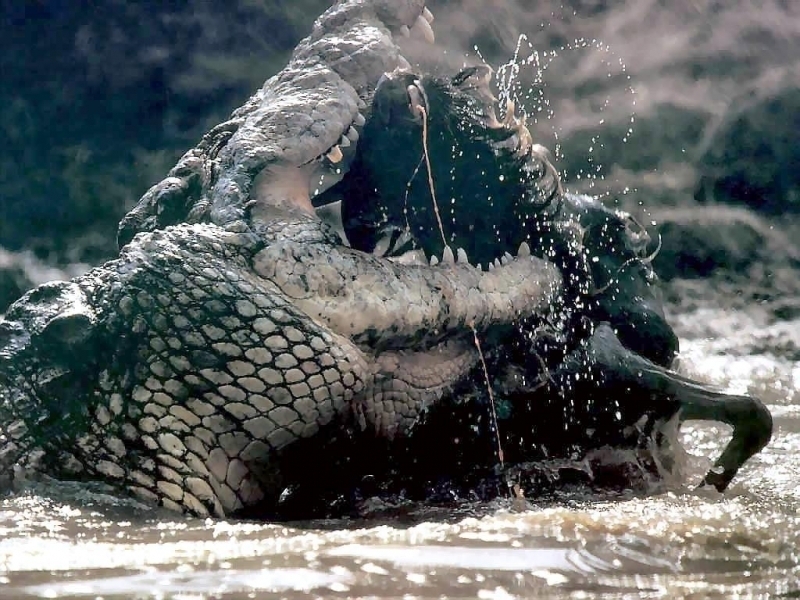 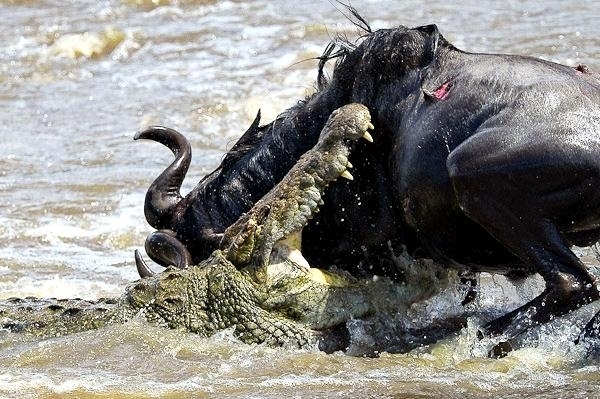 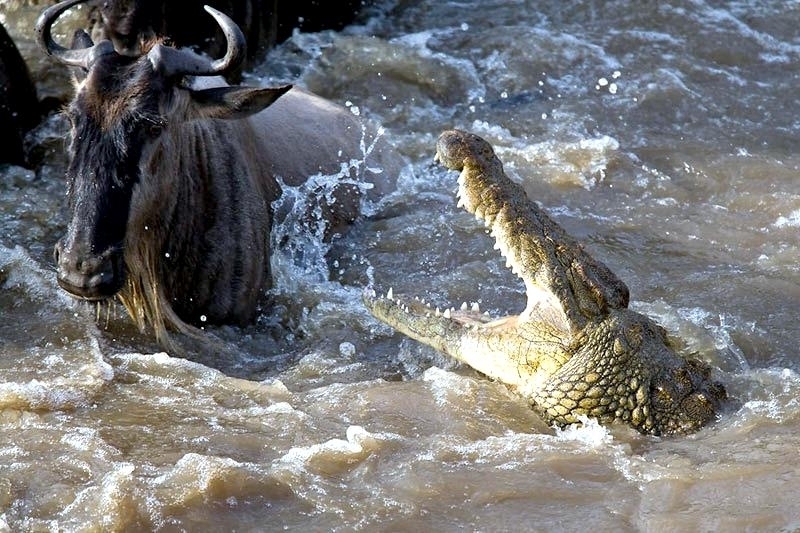 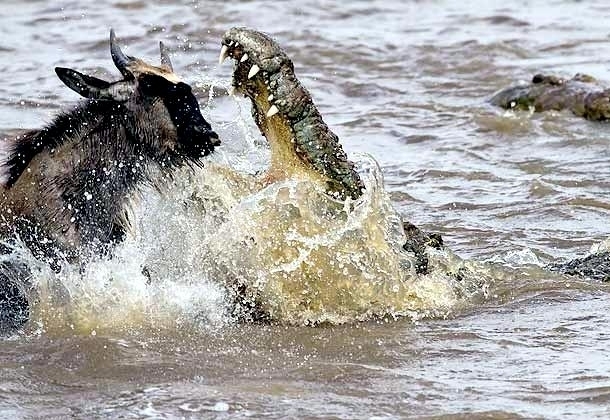 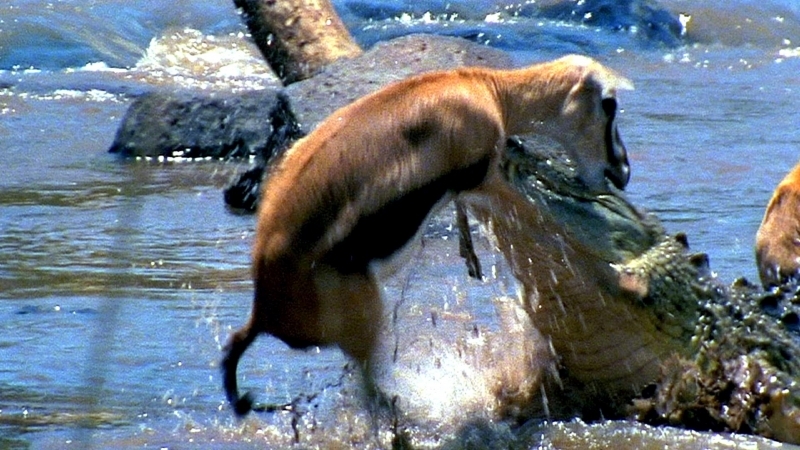 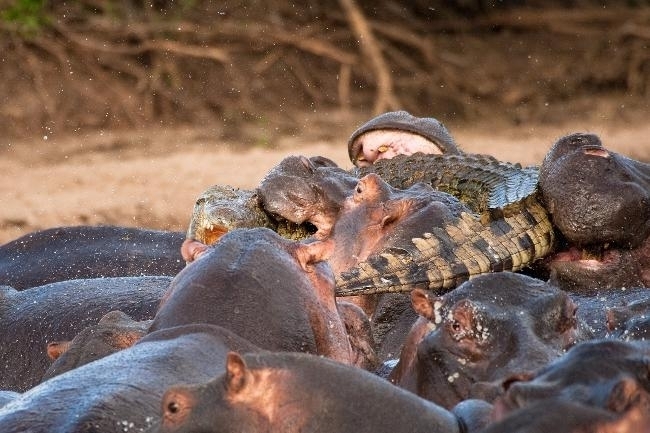 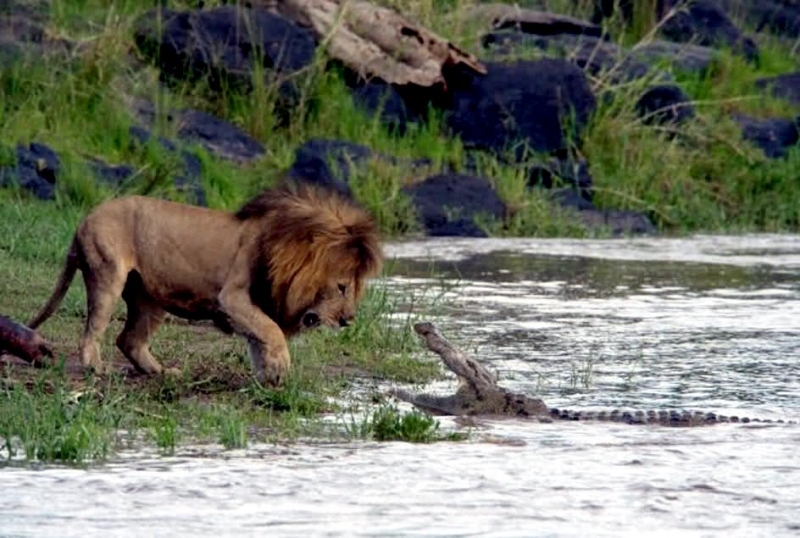 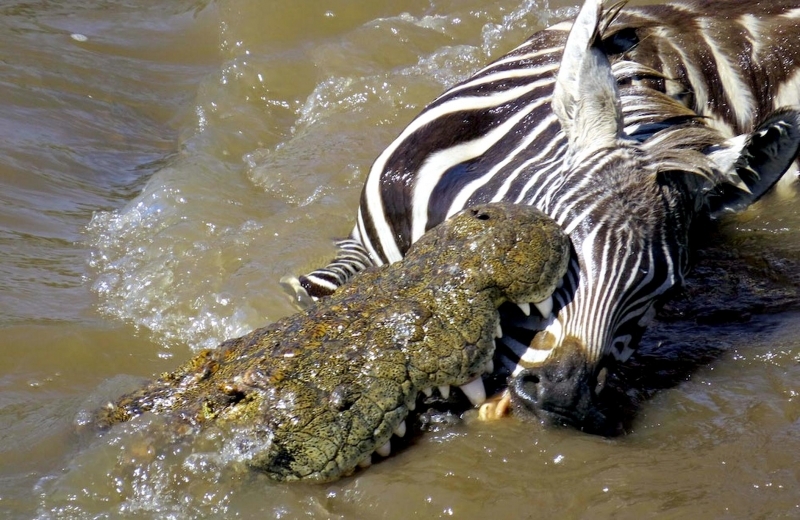 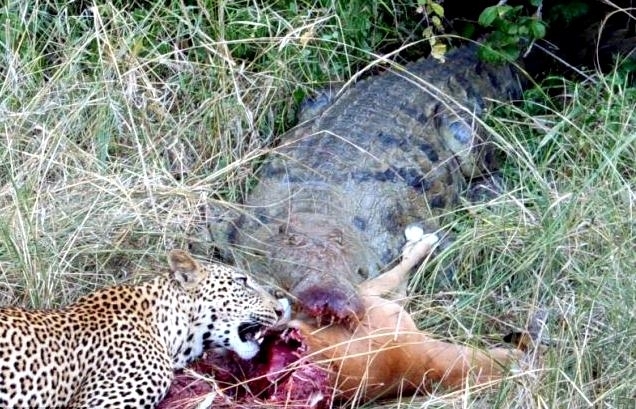 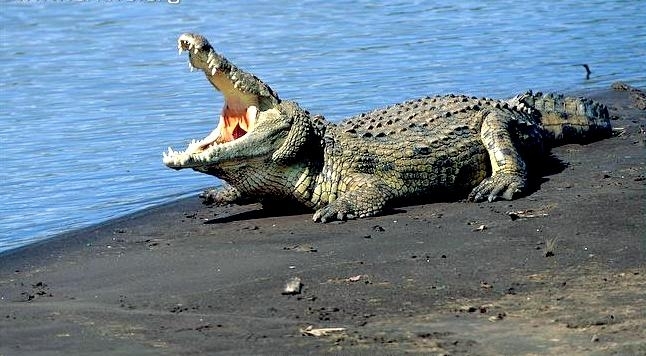 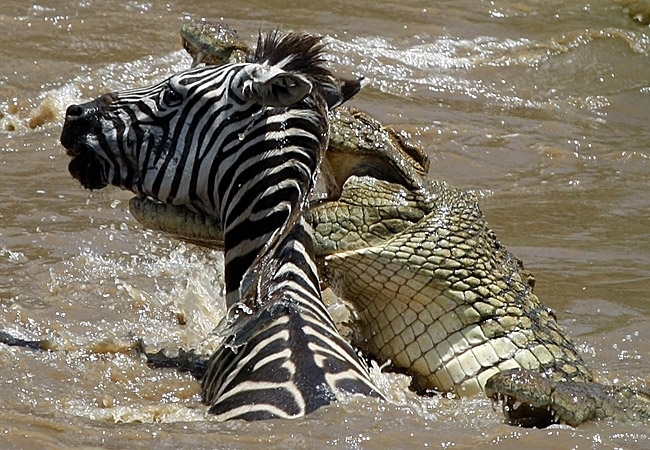 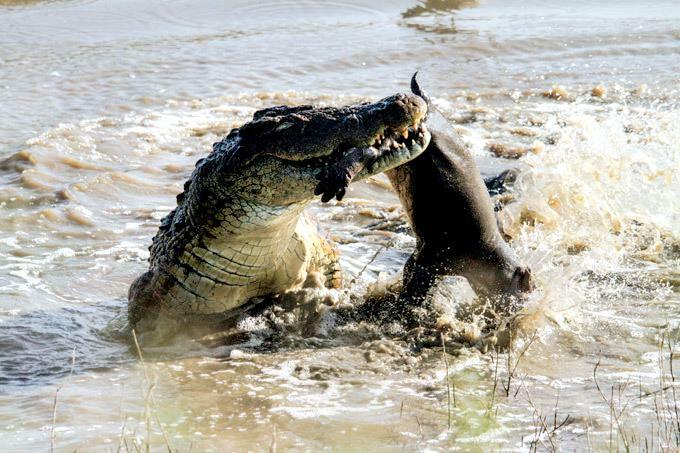 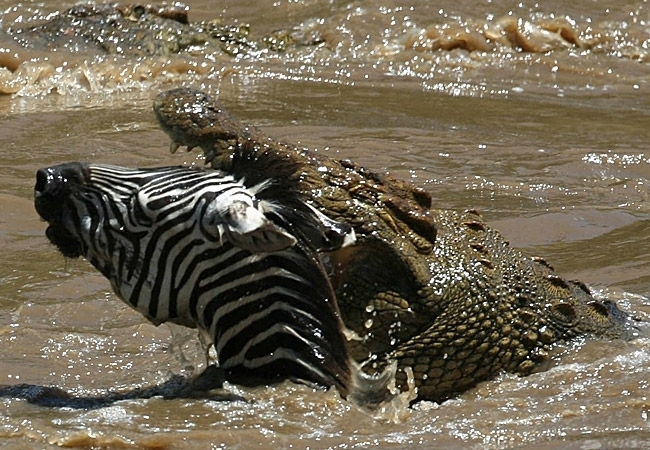 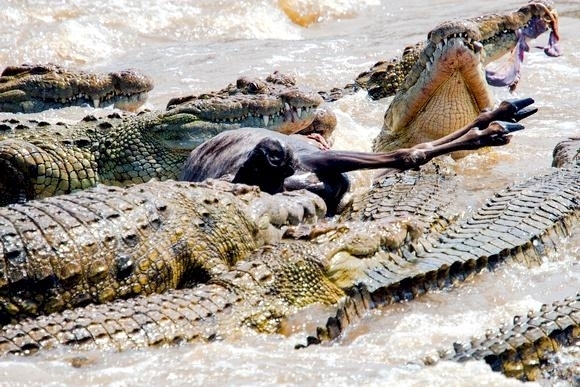 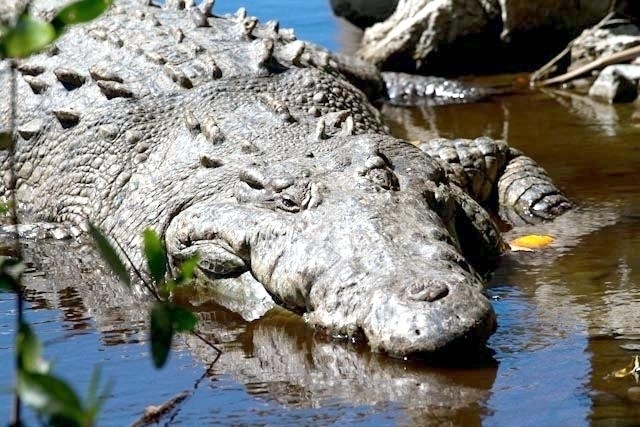 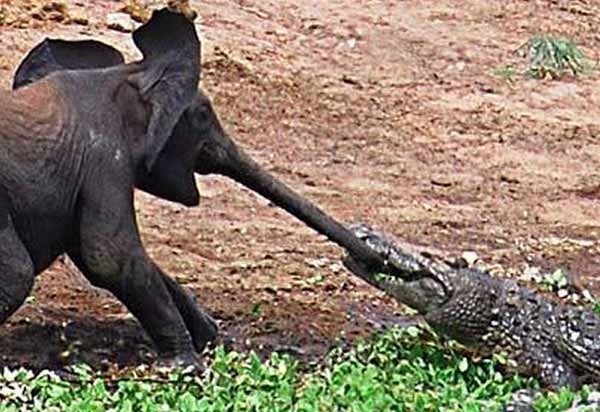 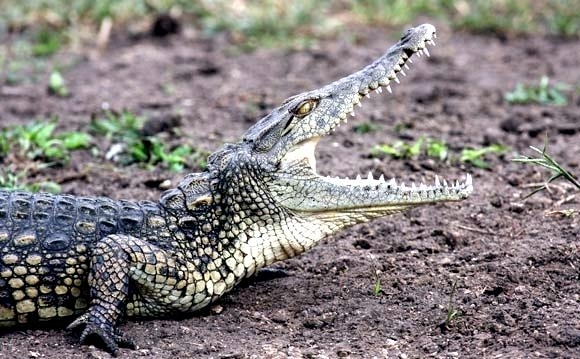 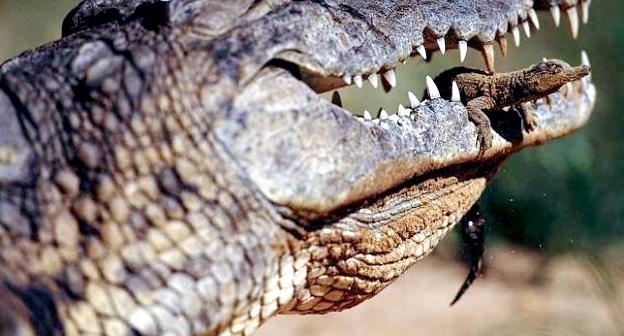 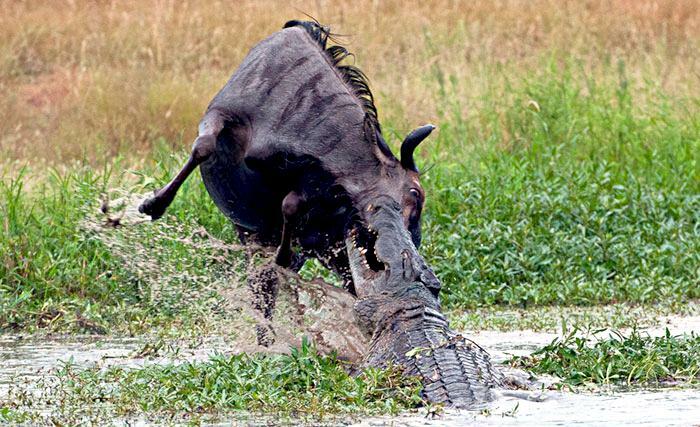 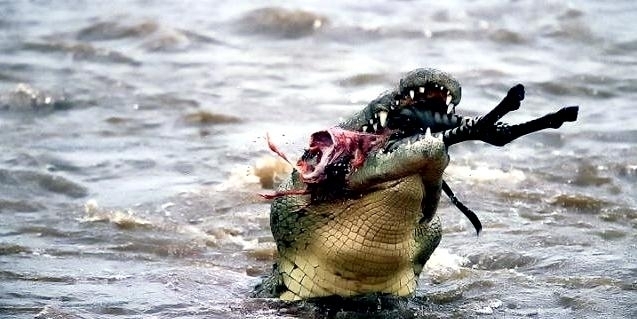 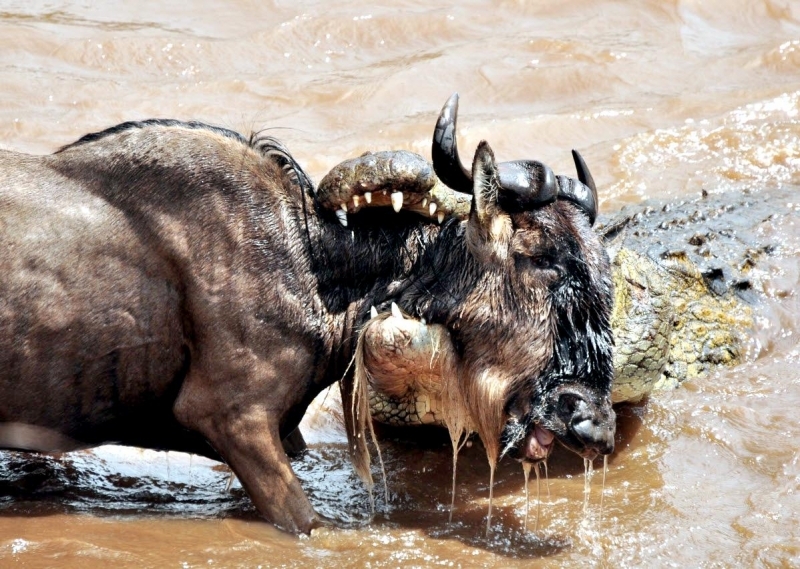 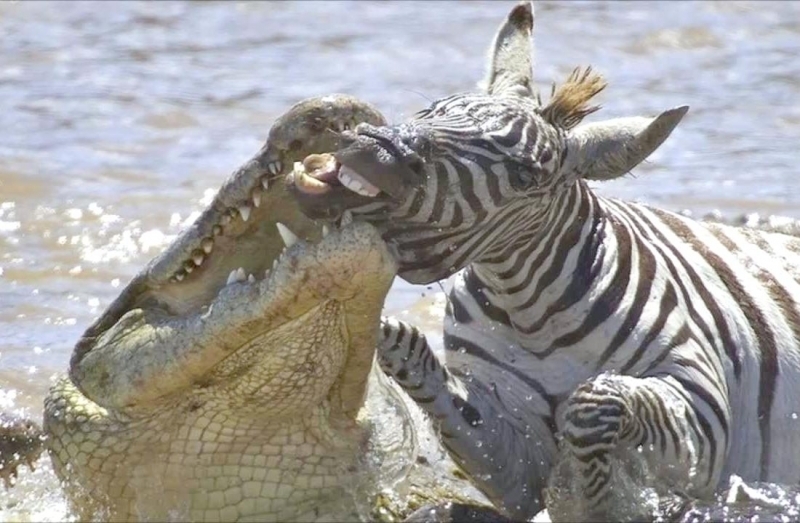 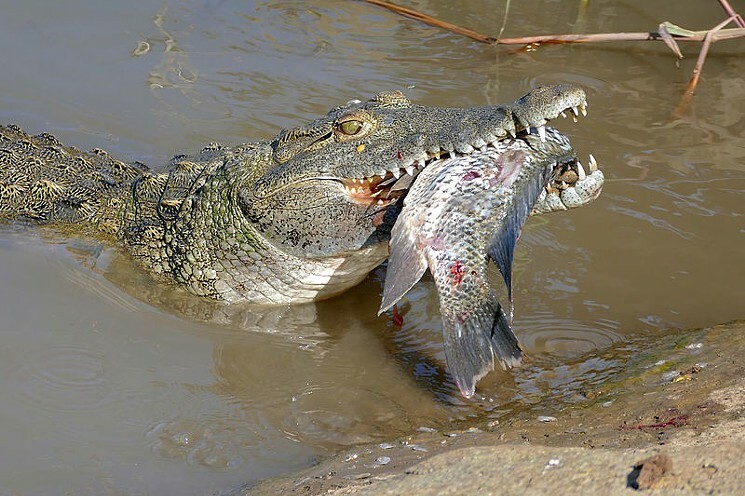 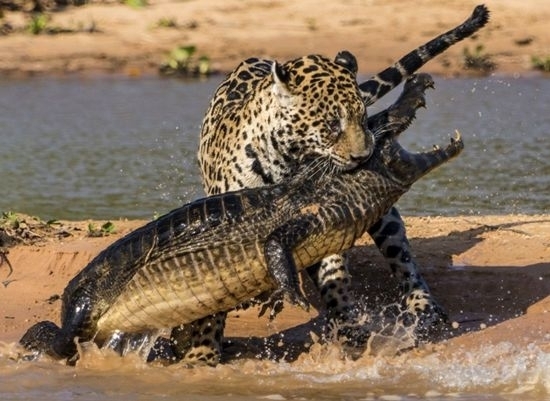 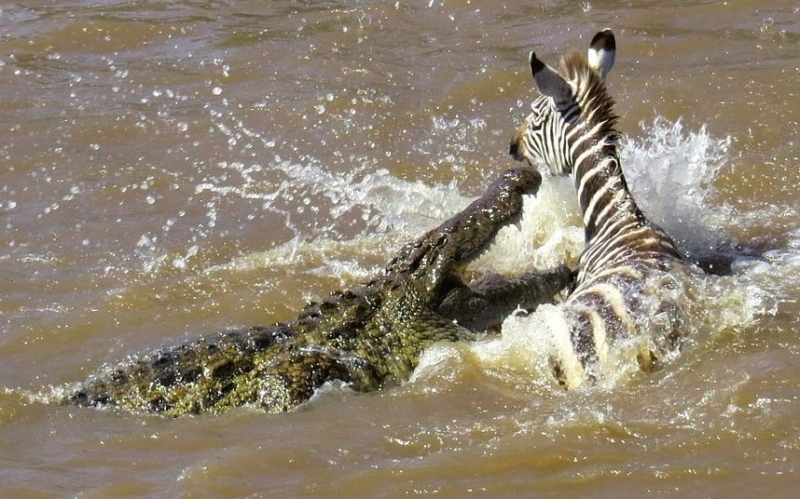 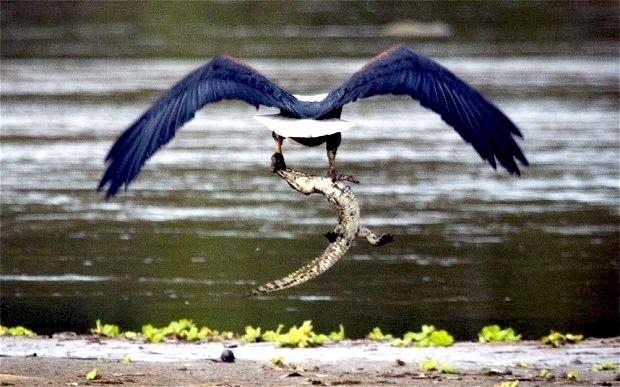 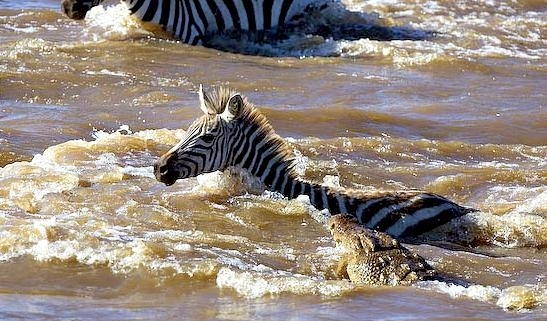 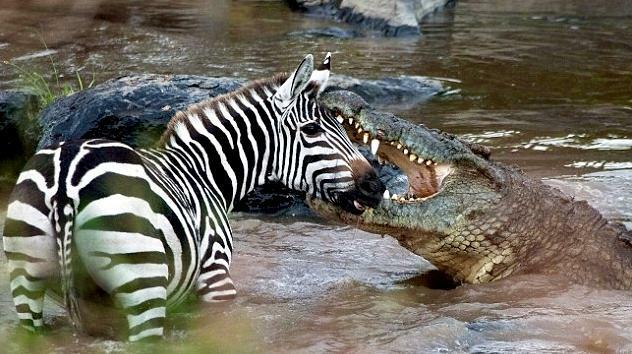 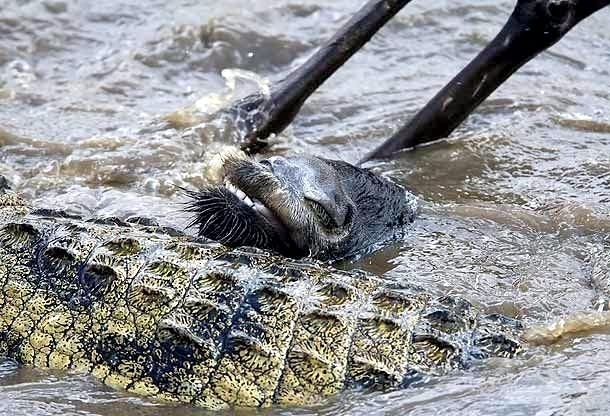 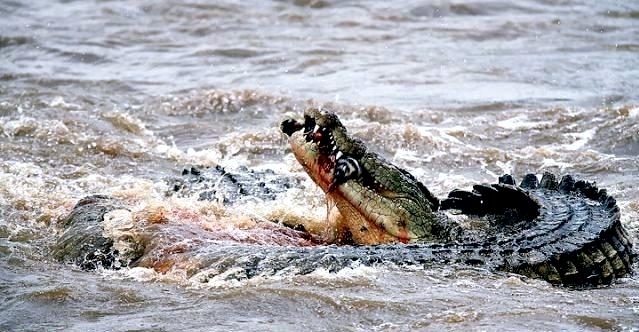 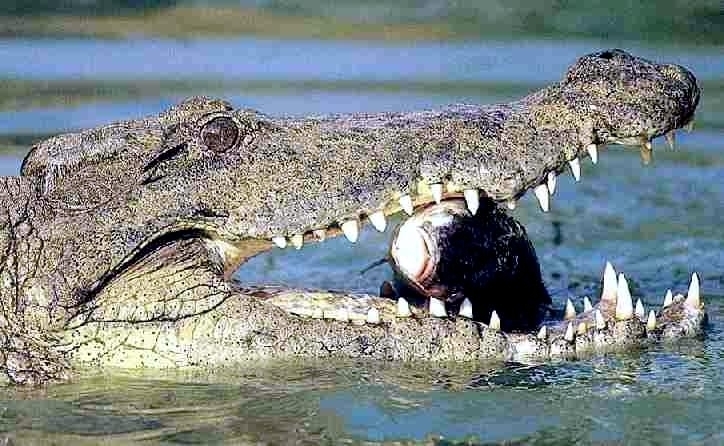 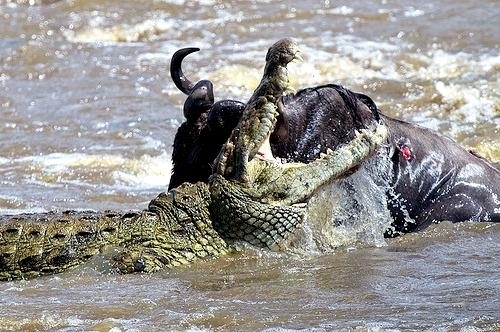 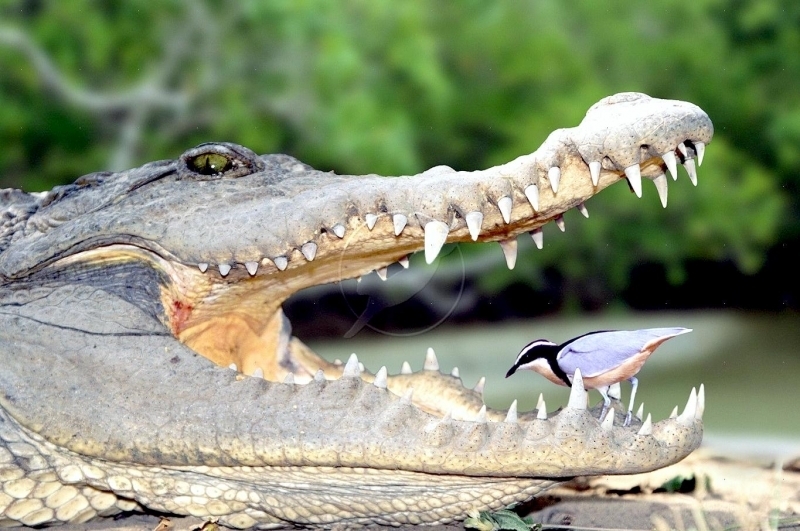 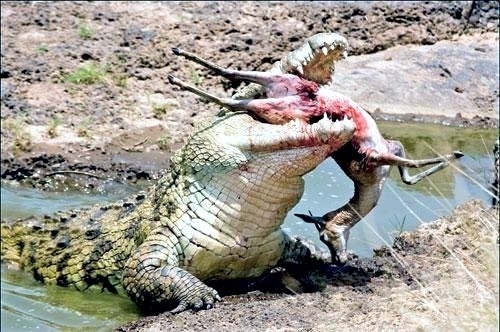 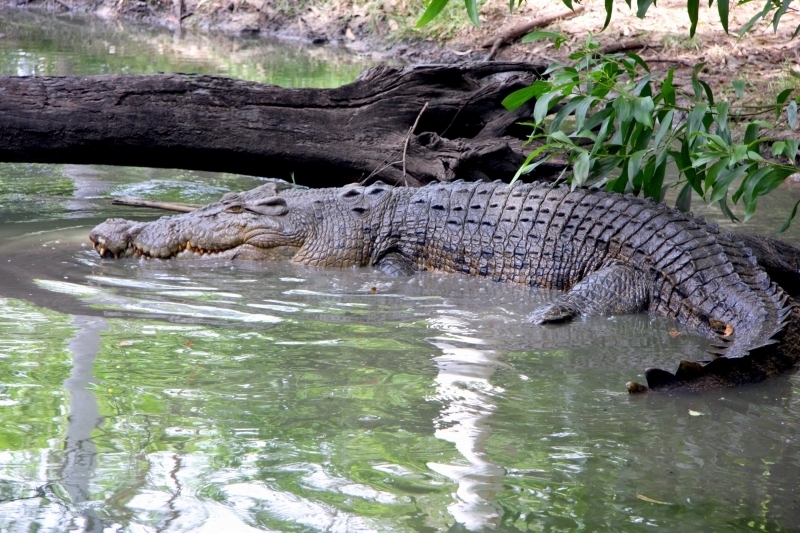 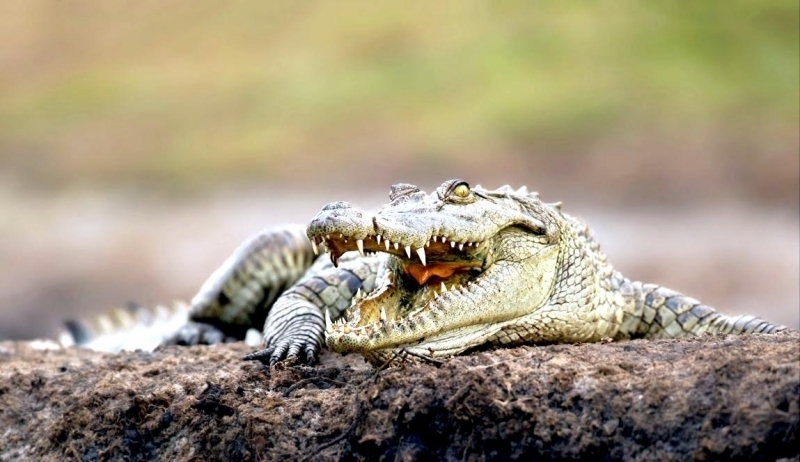 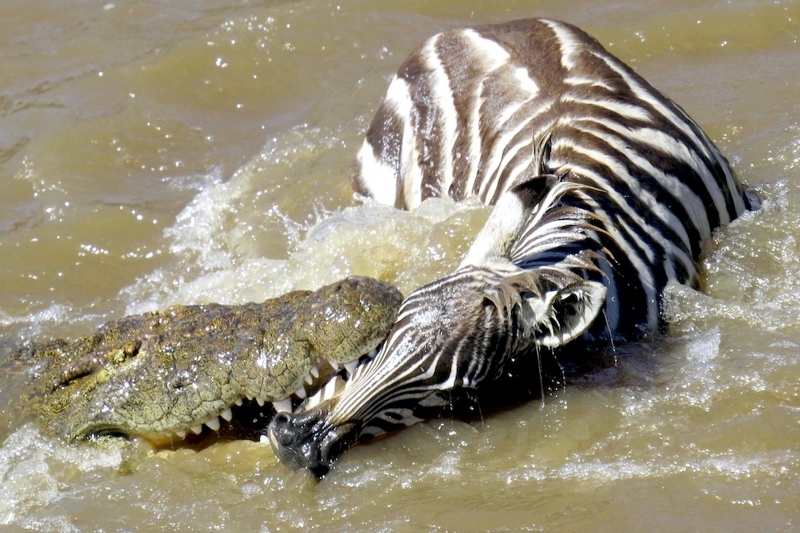 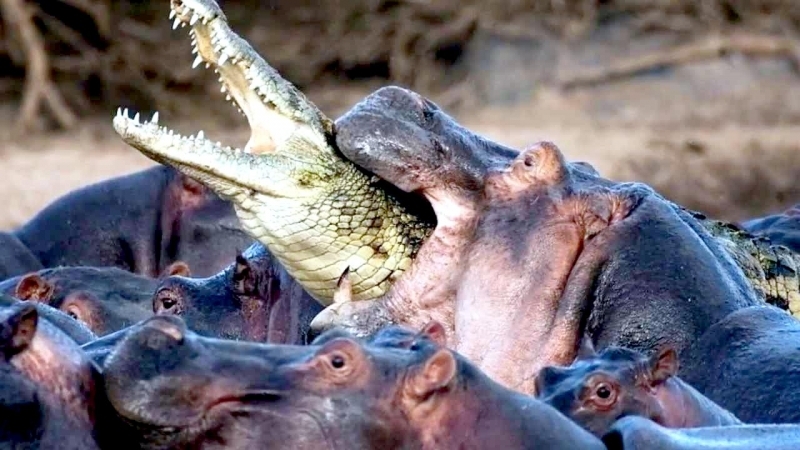 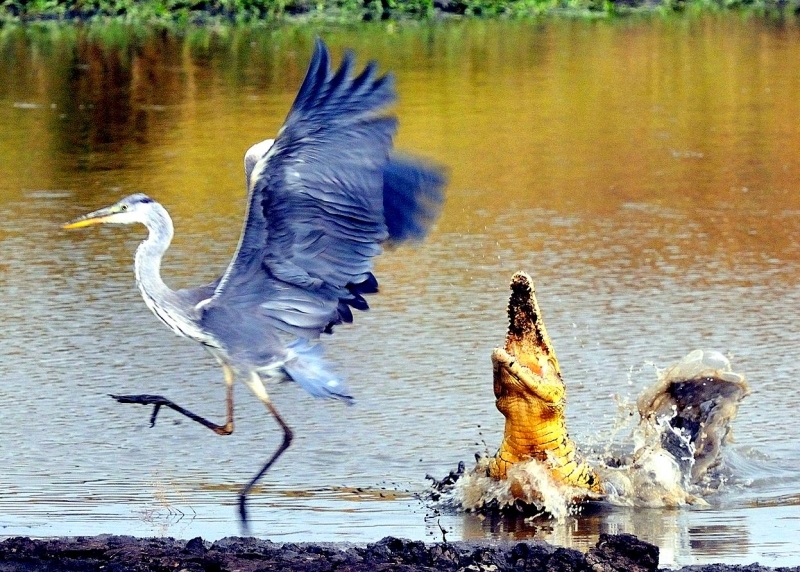 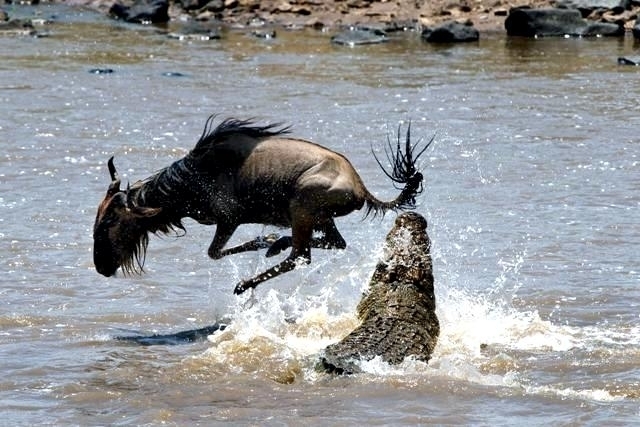 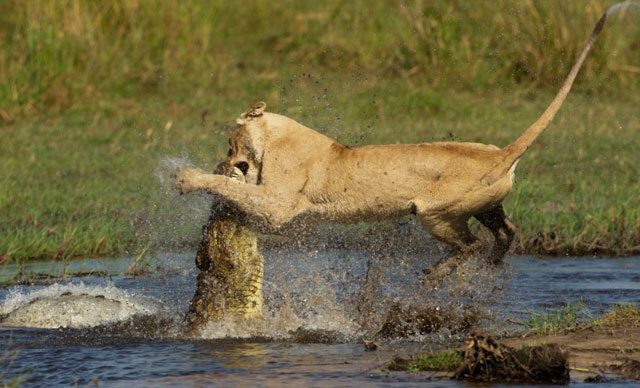 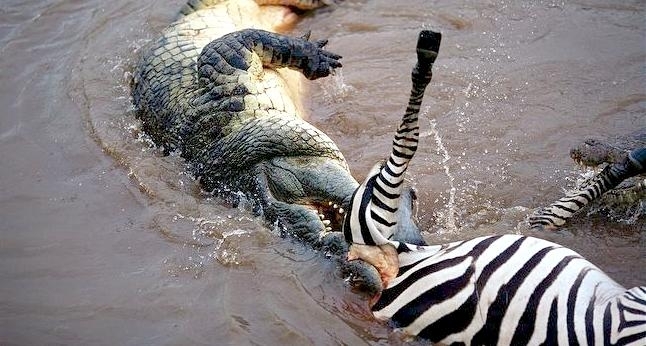 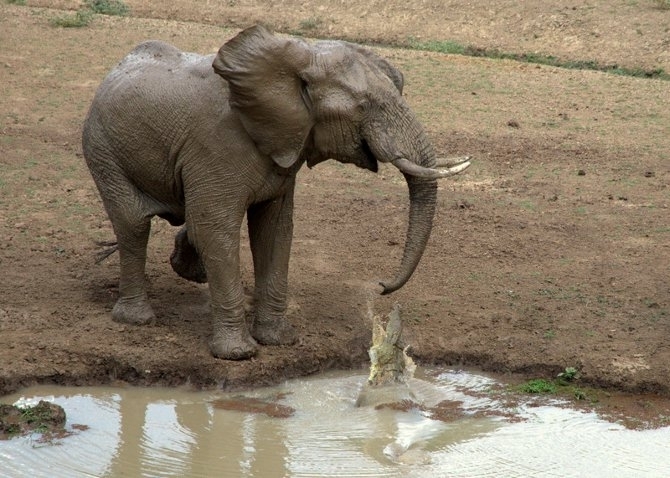 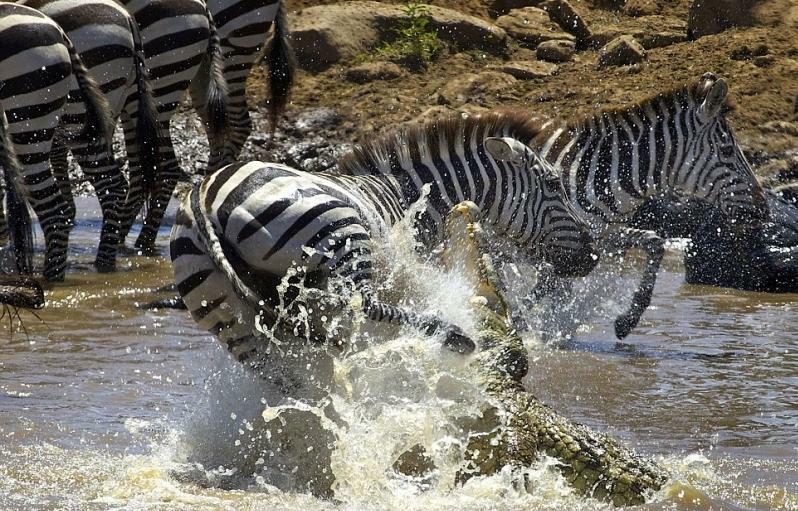 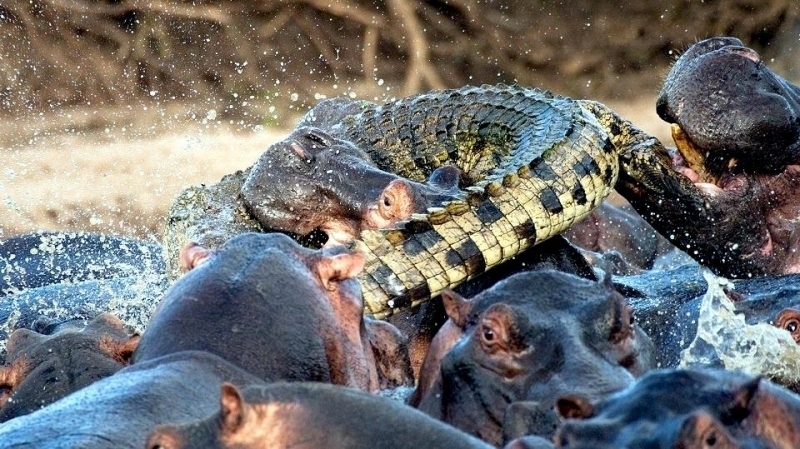 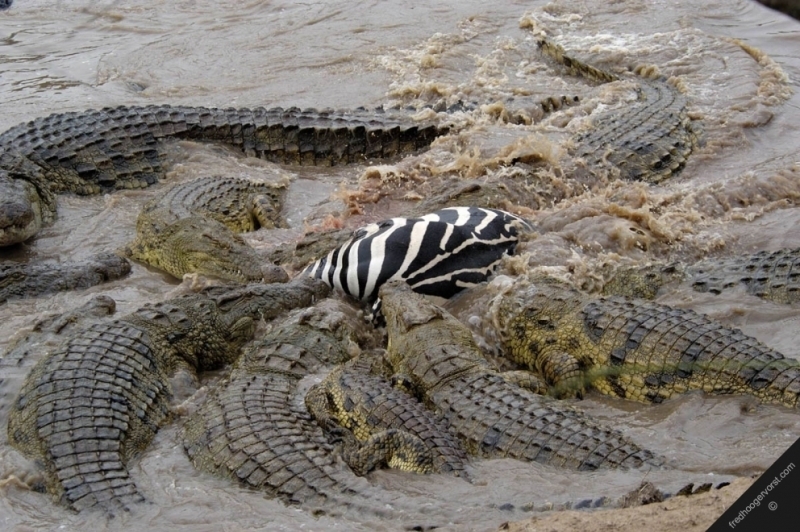 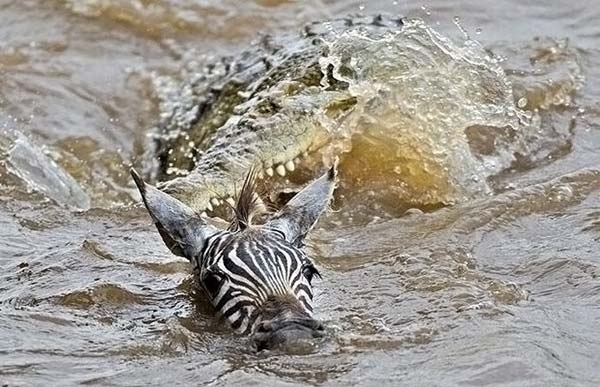 The diet of the Nile Crocodile is mainly fish, but it will attack almost anything unfortunate enough to cross its path including Zebras, small Hippopotamus, Porcupines, birds, humans and other crocodiles. 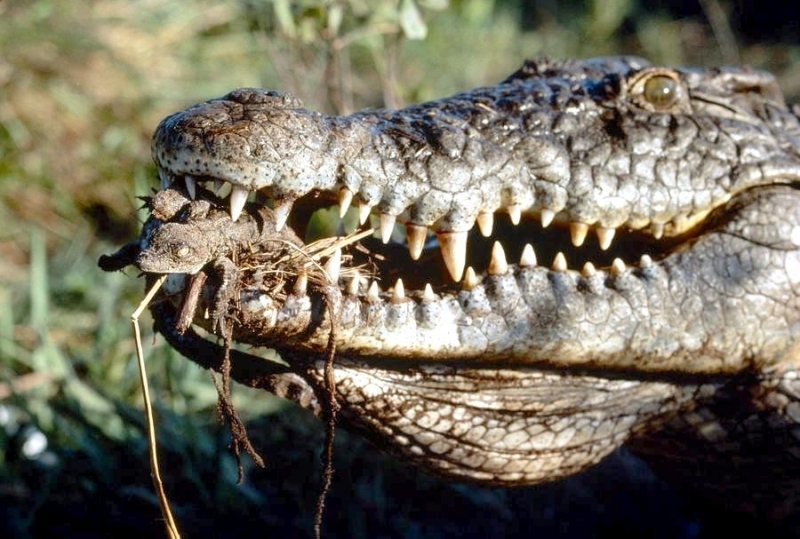 It will also scavenge carrion and can eat up to half its body weight at a feeding. 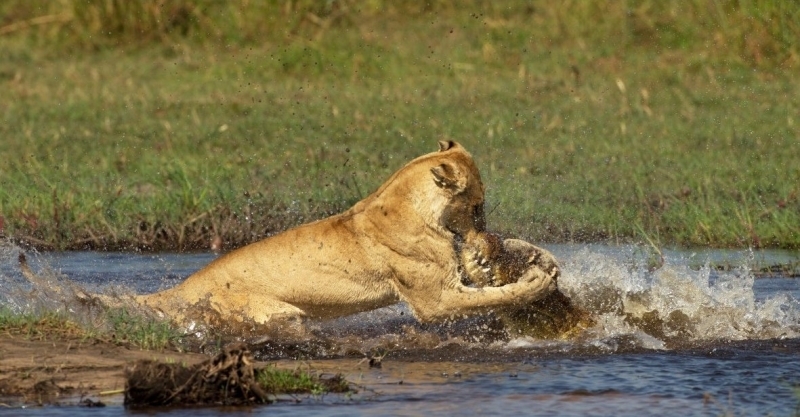 One unusual characteristic of this fearsome predator is its caring nature as a parent. 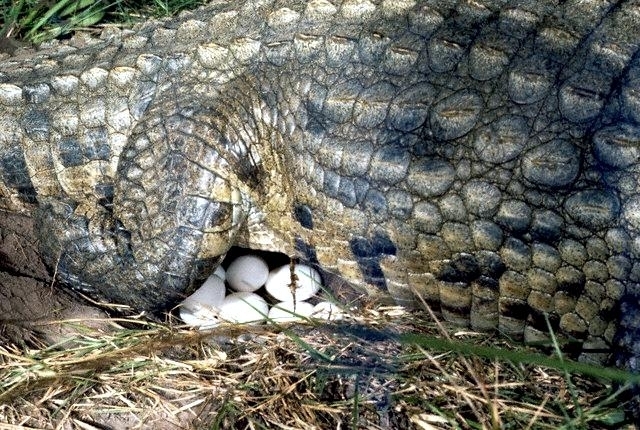 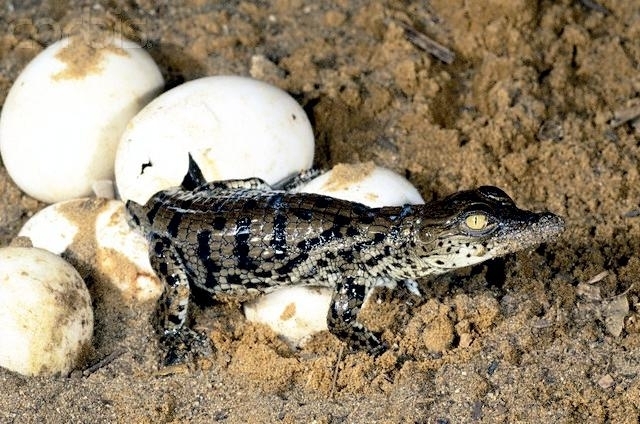 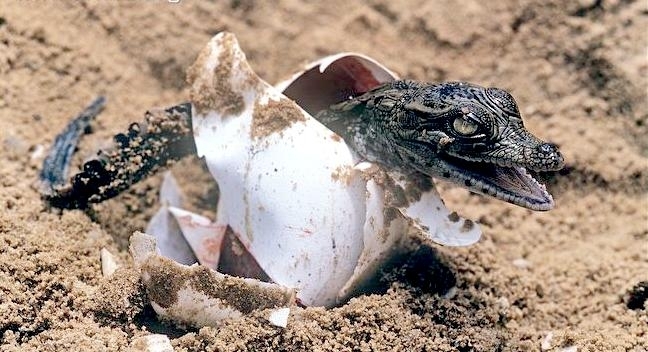 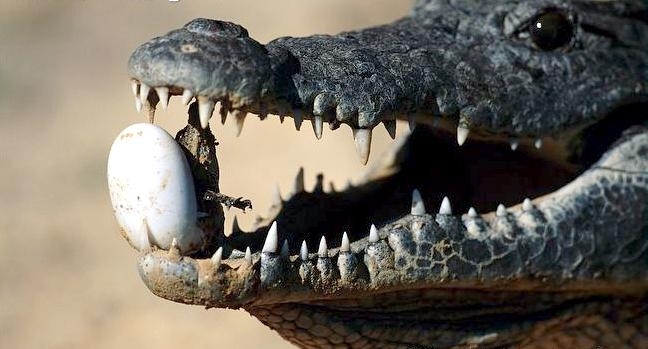 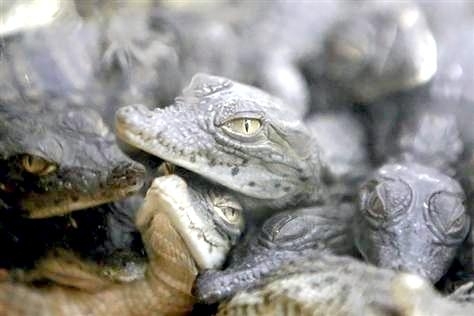 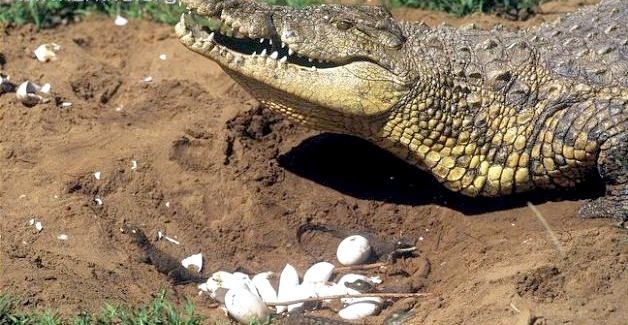 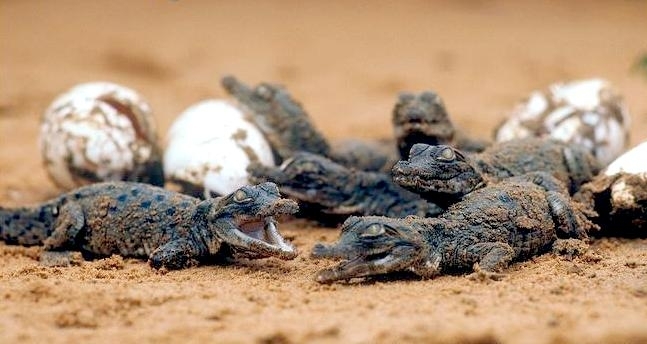 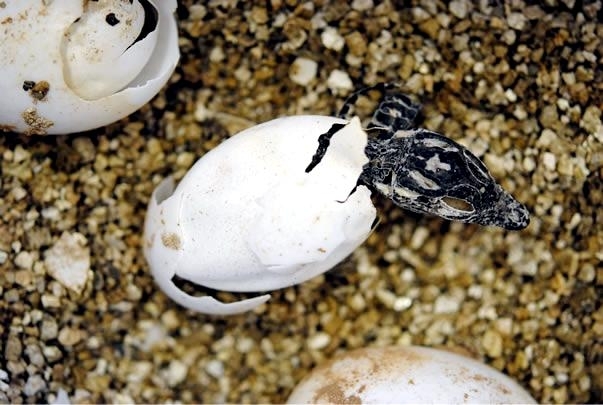 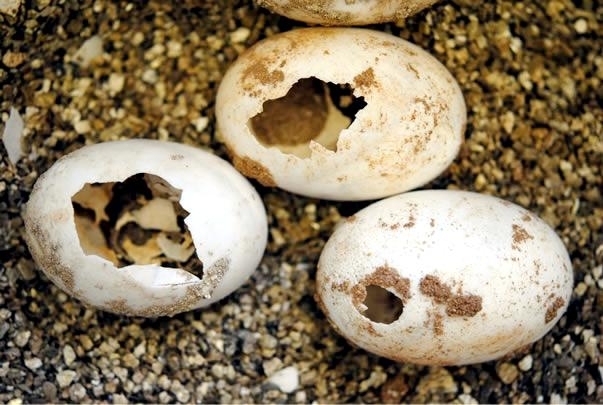 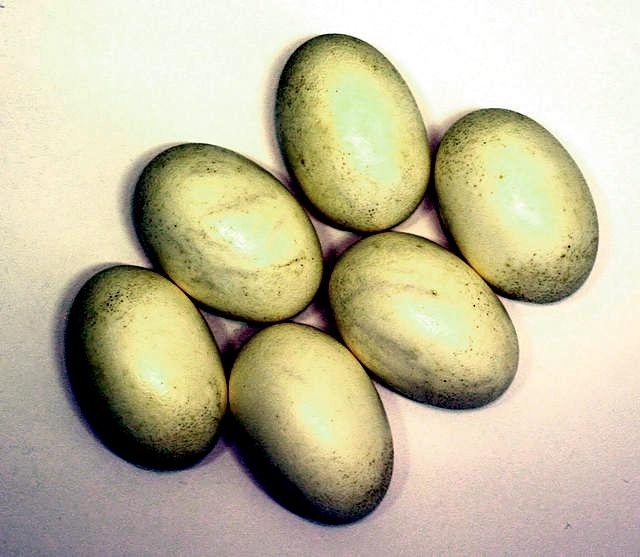 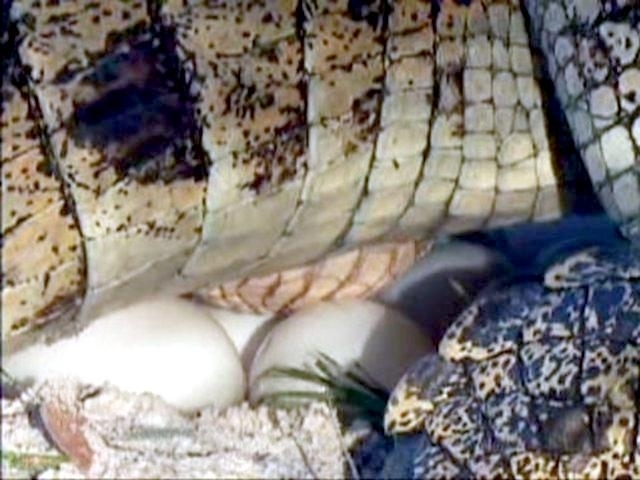 Where most reptiles lay their eggs and move on, both the mother & father Nile Crocodile ferociously guard their nests until the eggs hatch and they will often roll the eggs gently in their mouths to help hatching babies emerge. 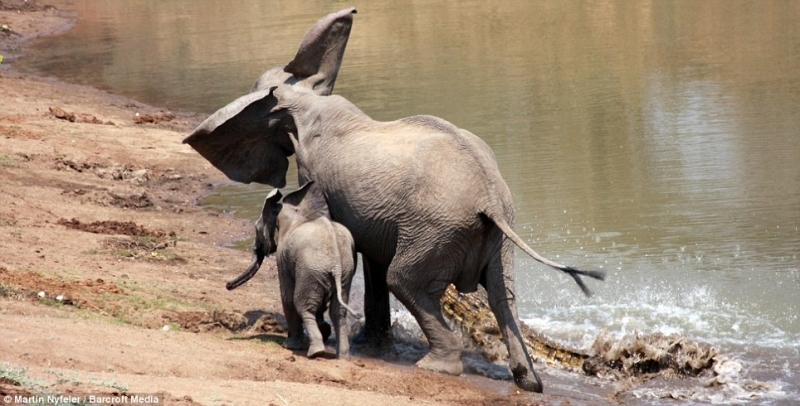 Hunted close to extinction in the 1940’s through the 1960’s, local and international protections have helped them rebound in most areas. 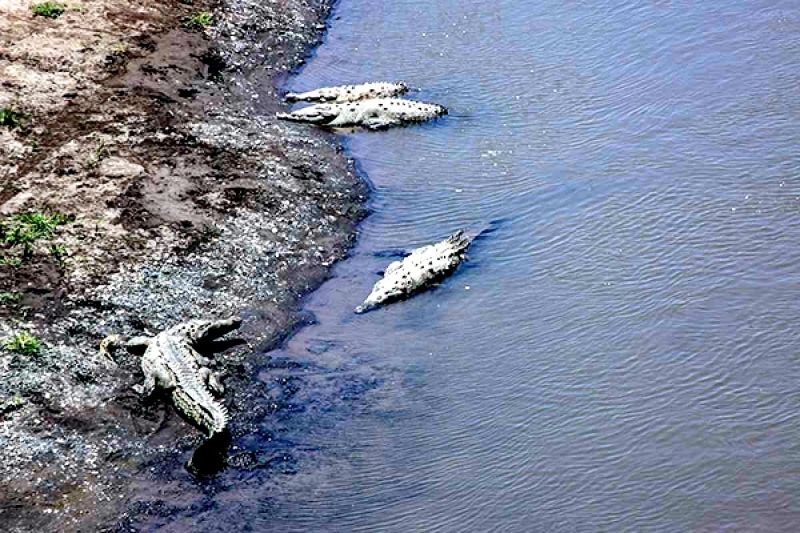 In some regions though, pollution, hunting and habitat loss have severely depleted their numbers. 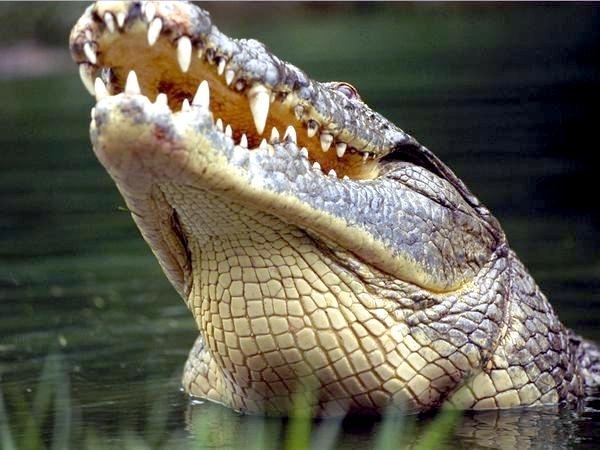 It is the symbol of Sobek, an ancient Egyptian Crocodile God that resembled a man with a crocodilian head. 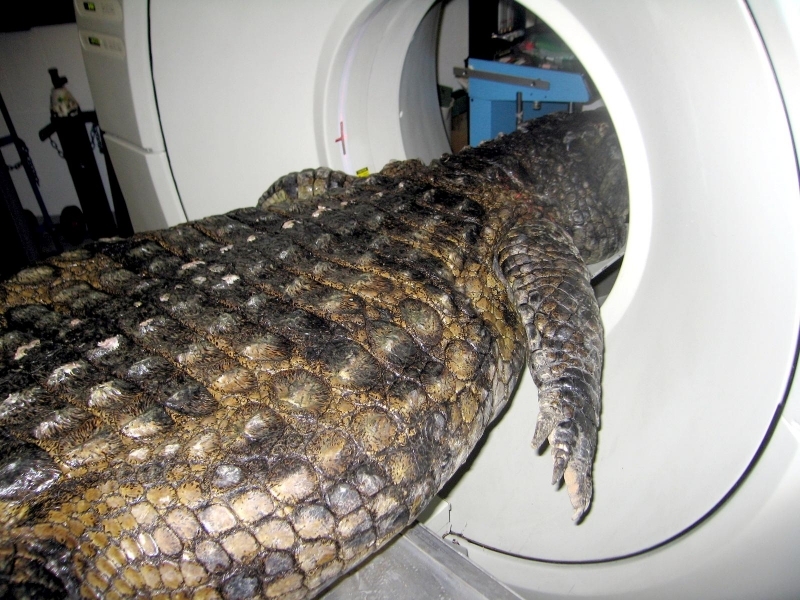 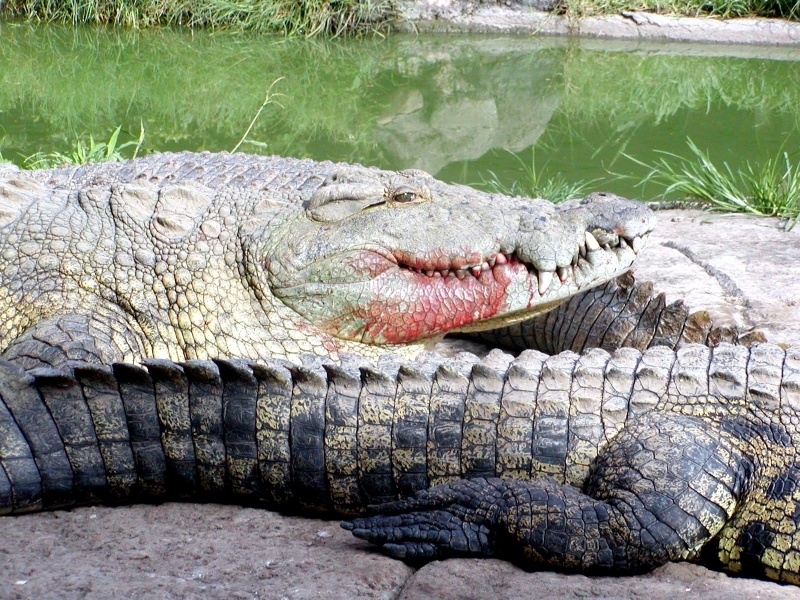 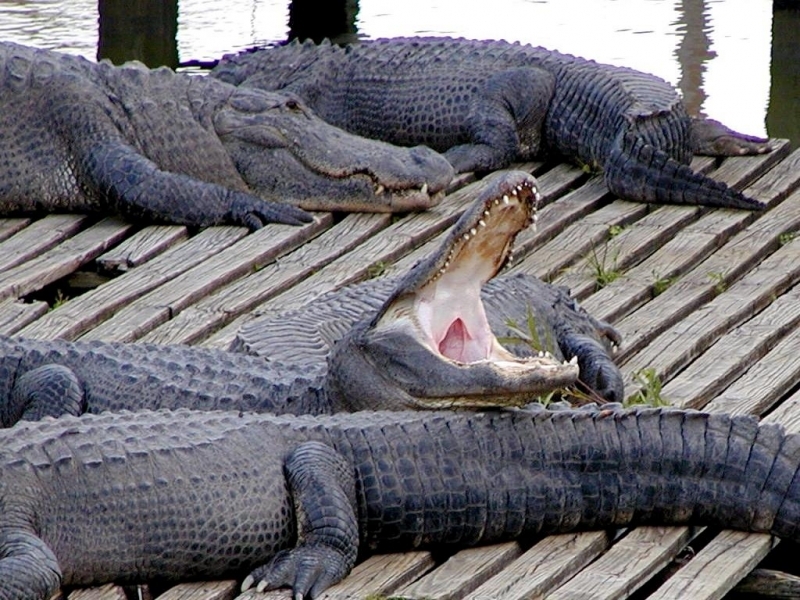 Nile Crocodiles were kept as pets by ancient Egyptians. 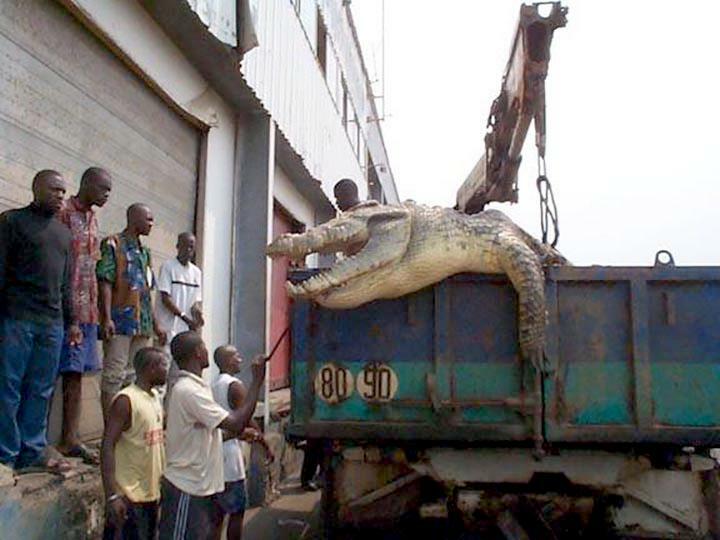 To this day, Nubian fishermen still mount stuffed Nile Crocodiles over their door-sills to ward against evil.